Nice, France is a small ancient city on the French Riviera. Located in Southeast France, it lies less than an hour’s drive from the Italian border and directly between Cannes and Monaco. 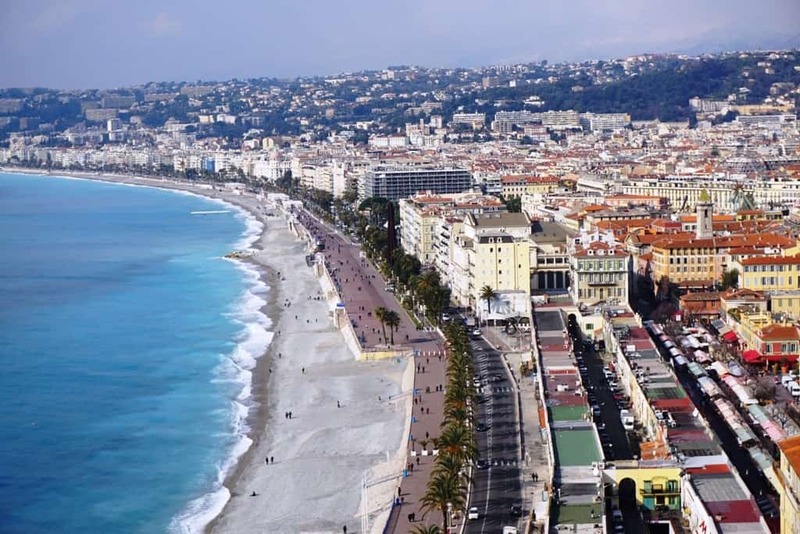 Nice is the fifth most populous city in France and has a history that dates back to antiquity. There’s plenty to do in this sun-soaked city, which attracts over four million visitors each year. 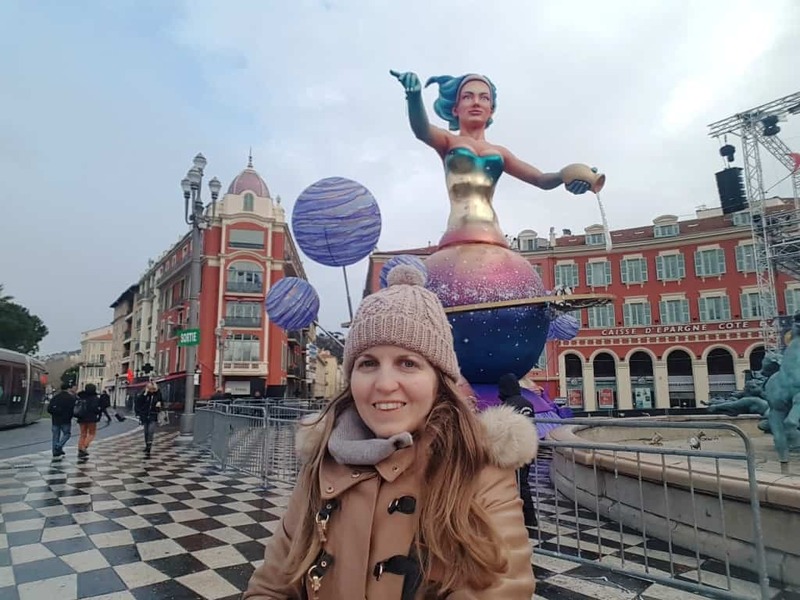 I recently spent 4 days in there so here’s my comprehensive list of things to do in Nice in winter. 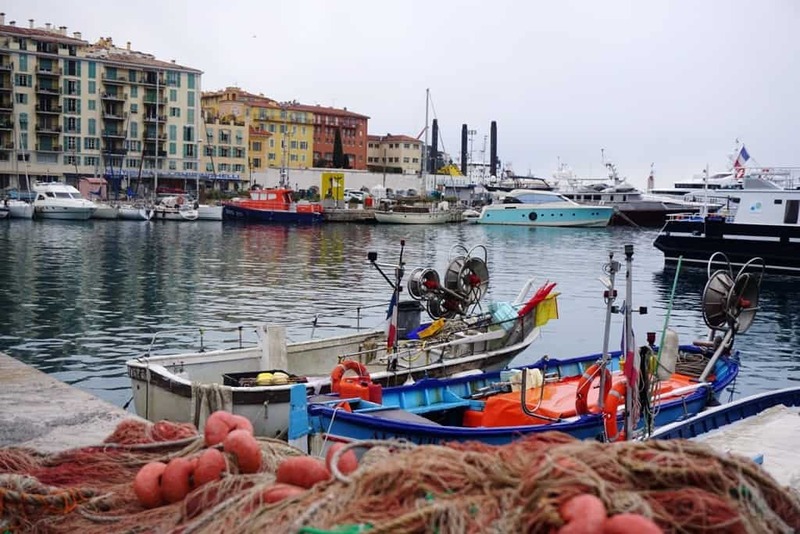 Despite Nice’s location just south of the Ligurian Alps, it enjoys a mild Mediterranean climate year round. Winter weather is typically around 11 degrees during the day, dropping a bit at night. What this means is that visitors enjoy sunny, warm days and cool, mild nights. There is average rainfall in the winter. 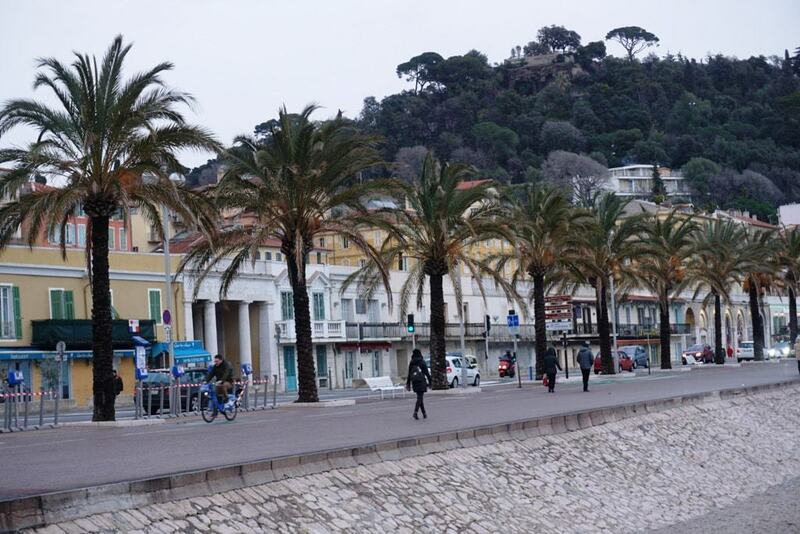 Nice has one of the warmest Mediterranean climates for its latitude. 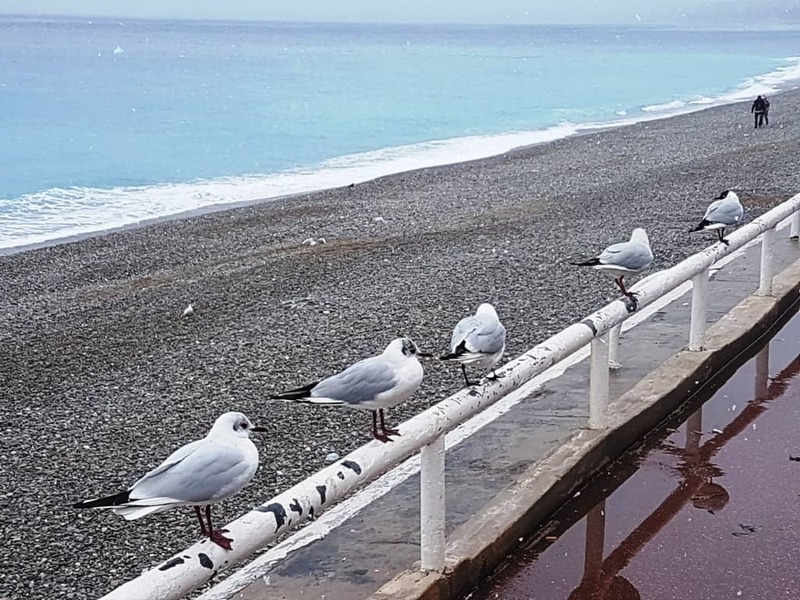 Unfortunately during my visit, the #beastfromtheeast was over Europe and the weather was not as usual in Nice. It even snowed which is extremely rare. Nevertheless, I had a great time and still it was much warmer than the rest of Europe. There are a few options for getting to/from Nice Airport to the city centre which are currently in the process of being updated and changed. The easiest way (which is not changing) is to take a taxi to the city centre. Alternatively, you can take the bus or the new tramline which is being opened and extended throughout 2019. 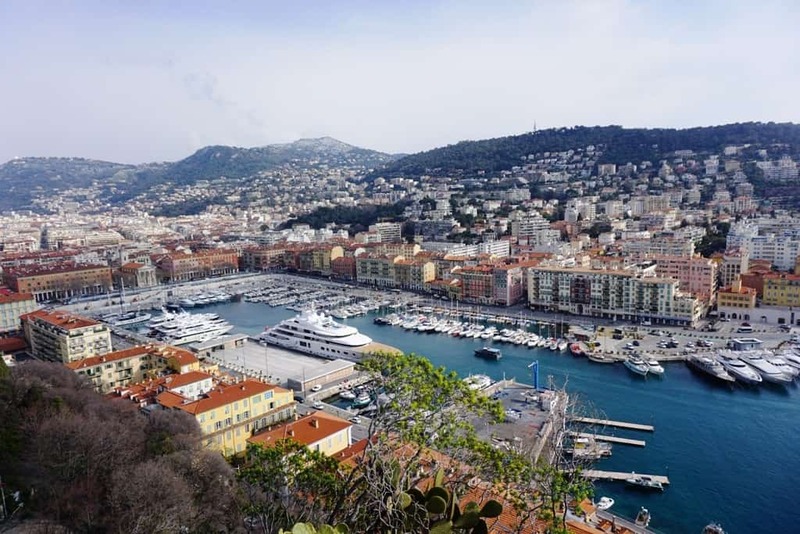 Buses are a quick and easy option to get to and from Nice Airport with both Aerobuses and public buses offering connections. Bus numbers 98 and 99 are Aerobus routes and travel directly from the airport terminals to the heart of Nice city centre. 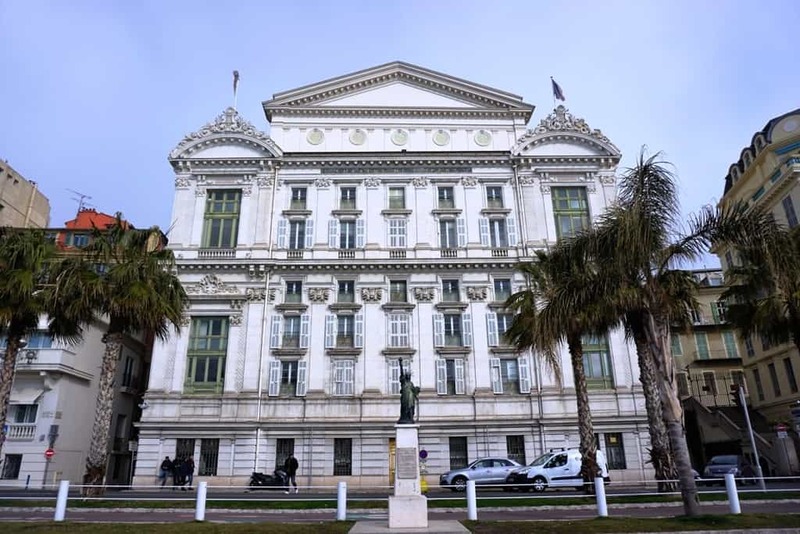 Bus 99 takes you to Nice Ville de Gare SNCF Train Station and number 98 travels along the Promenade des Anglais and goes via the town centre. This journey costs 6 EUR and takes between 15-20 minutes. Alternatively, you could take the slower public bus option which takes 30 minutes but only costs 1.50 EUR. This bus can be caught from the main road, outside of the airport so it does require a short walk to get there. Please note: These options are likely to change when the tram runs in full operation. The tram from Nice Airport to the city centre is the most modern transport link and is in the process of being extended and opened to reach wider areas of the city. Tramline 2 is the current airport option which runs to/from Nice-Port Lympia to Nice Côte d’Azur Airport. It serves both Terminal 1 and 2 so all travellers are able to use the service. Journeys aboard the tram have a flat fare of 1.50 EUR and you can use the same ticket to connect to other buses within the city centre within a timeframe of 90 minutes. If you would rather take a taxi from Nice Airport you can find the taxi rank outside and look for an official car with a blue “taxi” sign on the roof. The journey should take between 10-15 minutes so it’s a great option for those with luggage or travelling in a group. There is a flat fare of 32 EUR for official taxis but please be aware that some taxis may charge more for public holidays/weekends and night travel. For added convenience you can also book a transfer through Welcome Pick-Ups, so the driver is waiting for you with a welcome sign when you arrive. Welcome drivers speak fluent English and are happy to help you with top tips about what to do in the area. The Promenade des Anglais, named for the English who funded it in the 19th century, is a five kilometre walk that curves around the Baie des Anges. It is a popular destination for locals and visitors, who come to enjoy a sunny day or a calm evening. 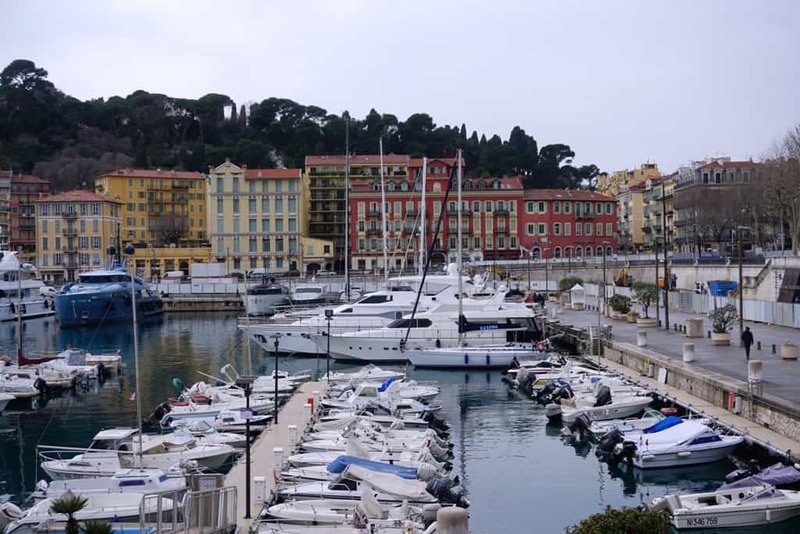 Many of Nice’s main attractions are within walking distance from the Promenade’s central location. 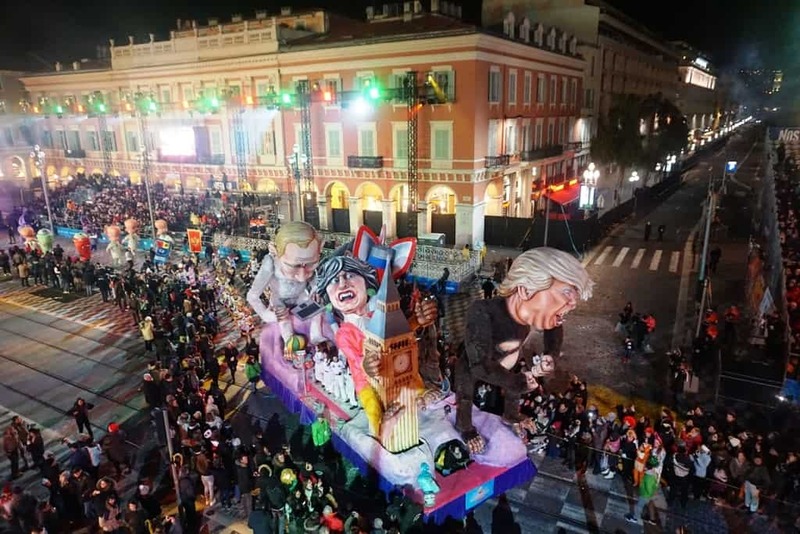 The Carnaval de Nice is not only one of the most well-attended carnaval celebrations around the world, it is also one of the oldest and most loved. While there is evidence for earlier celebrations, the modern carnival celebration dates back to 1873 and takes place each year from mid-February to mid-March. 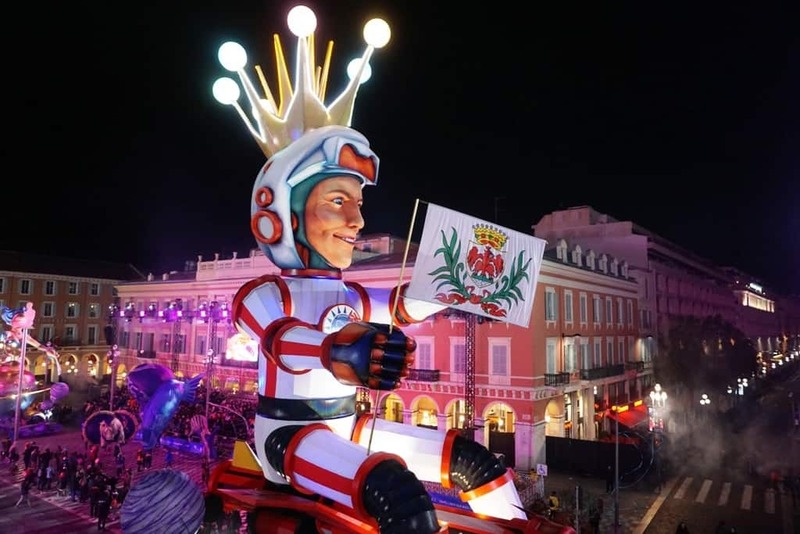 The Carnaval de Nice always has an overlying theme that carries through the entire festival. Floats usually have something to do with the theme, current political events, and other related scenes. 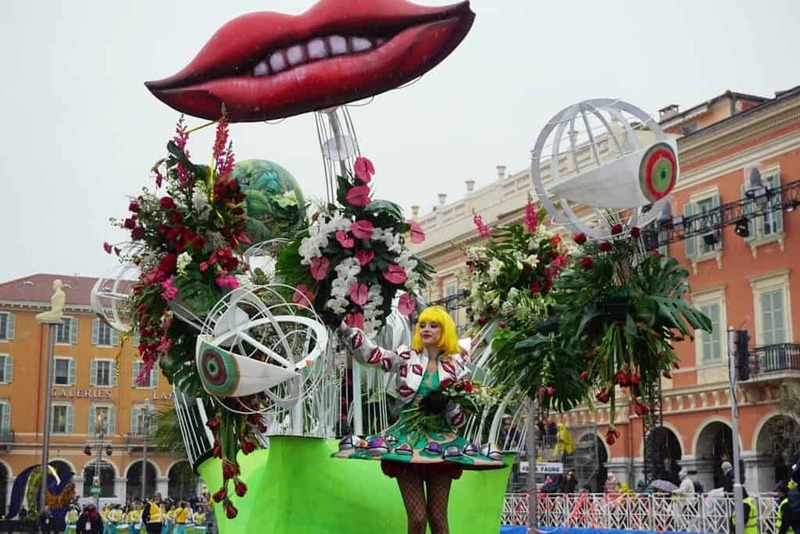 The six parades of the festival take place in and around the Place Massena and the Promenade des Anglais. I was in Nice during the Carnival and it was amazing. I totally recommend that you visit this time of year. Read more about the Carnival here. The Colline des Chateau is a former citadel atop a promontory overlooking the old city of Nice. 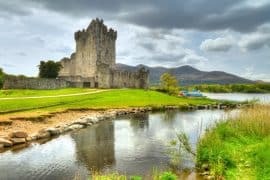 The original citadel was built in the 11th century and used for defense purposes until Louis XIV destroyed it in the early 18th century. So, there is no castle there anymore, despite the name, although there are bits and pieces of ruins scattered around the park. Castle Hill is one of the best lookout points in Nice, with views stretching across the Baie des Anges, the Promenade des Anglais, the Port of Nice, and the inland mountains. 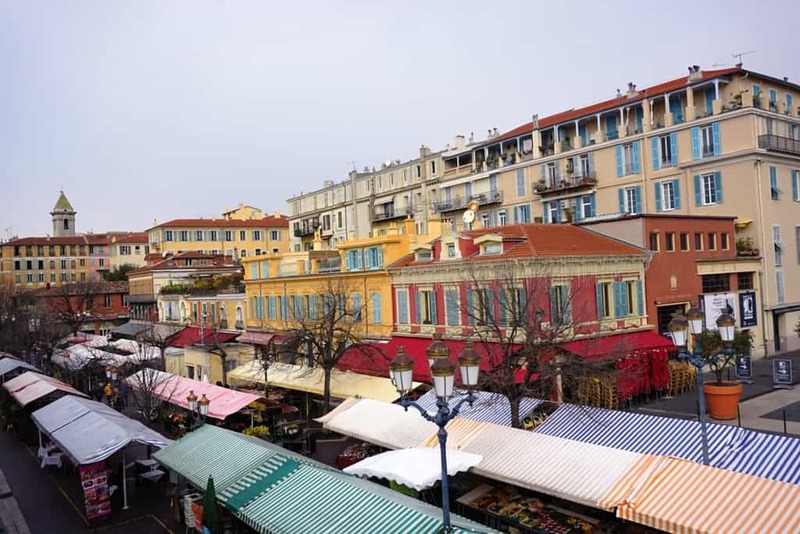 Les Ponchettes is the name for the row of buildings that lie between the famous Cours Saleya flower market and the Promenade des Anglais. They were built in the 19th century and two of the vaulted halls now house art galleries. Located at the far edge of the Promenade des Anglais, there are also various outdoor cafes and shops within the Les Ponchettes. 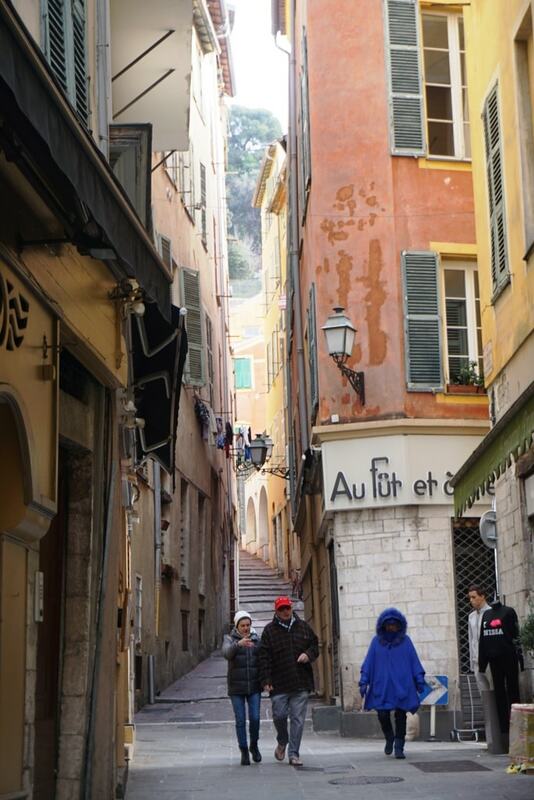 Locals barely flinch, however visitors to Nice might be a tad surprised when, at noon each day, a cannon goes off. The history of this unique (and very random) tradition dates back to 1860, when Scotsman Sir Thomas Coventry was living in Nice. His wife was not very punctual, apparently, so he requested that the soldiers set off a cannon to remind her to return home! 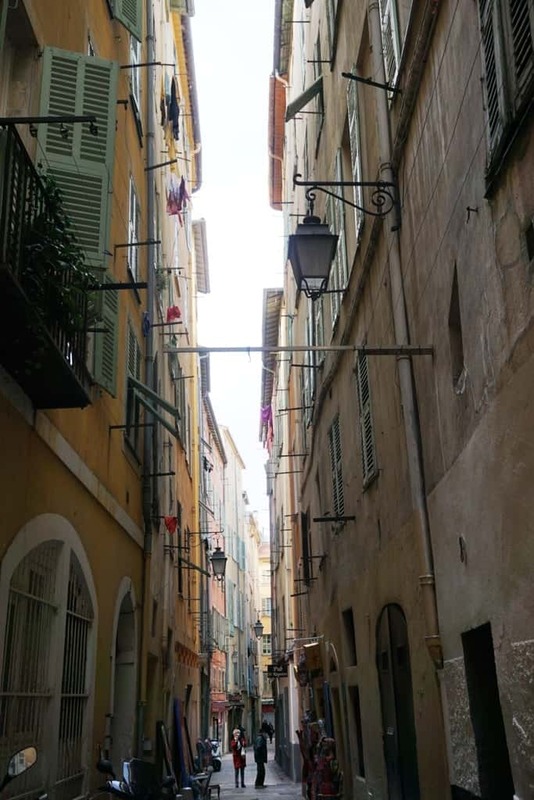 Although Coventry and his wife returned to Scotland, the locals were so accustomed to the cannon that they petitioned to continue the midday shot. .
Vieille Ville, or Vieux Nice, or Old Town of Nice, is a popular, quaint, must-visit spot for visitors to the city. Its narrow lanes and colourful buildings are home to boutique shops, hotels, cafes, and markets. On any given day, the streets are full of locals and visitors enjoying the local atmosphere. 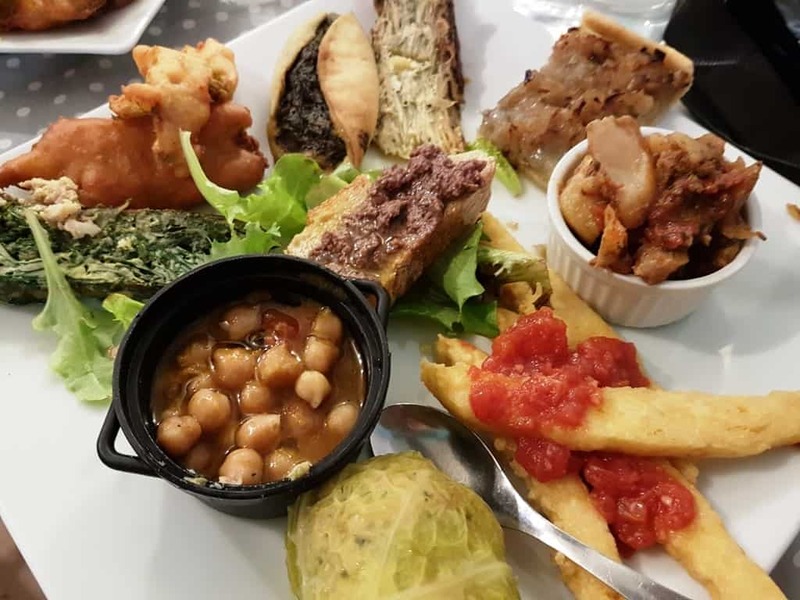 Several of the highlights on this list are within the boundaries of Vieille Ville, like the cathedrals, markets, Palais Lascaris, and Castle Hill. 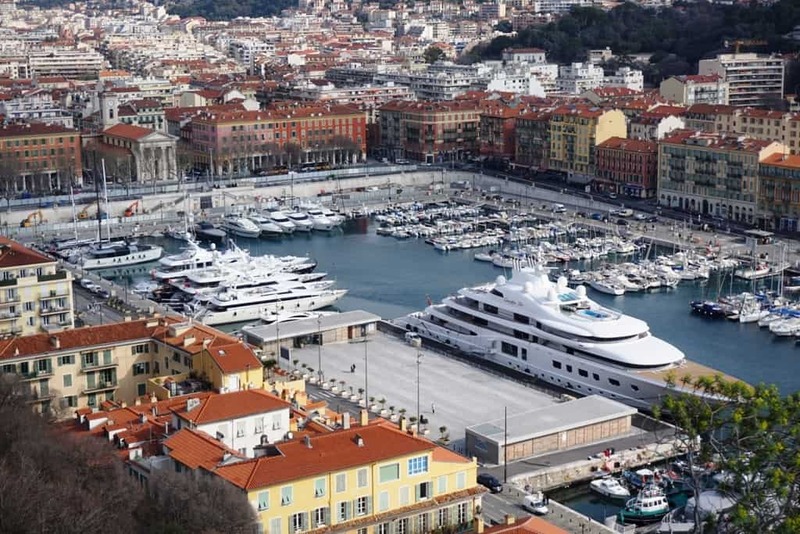 The Port of Nice is one of the major Mediterranean ports. It can accommodate 530 yachts and also is the main port for small cruise ships. It is surrounded by Italian Genoese-style arcades inspired by the Renaissance. The port is mere steps from the Old Town and its many cafes, shops, and galleries. 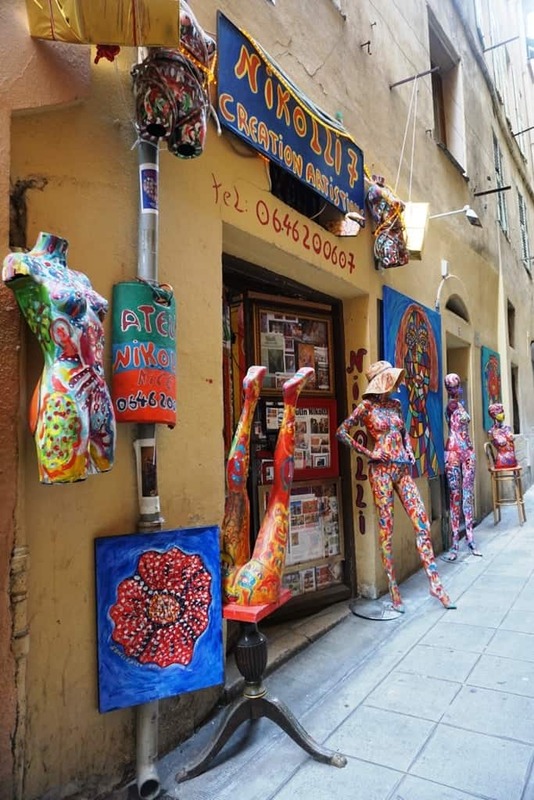 Nice boasts a variety of excellent museums and galleries, from art museums to architectural marvels. 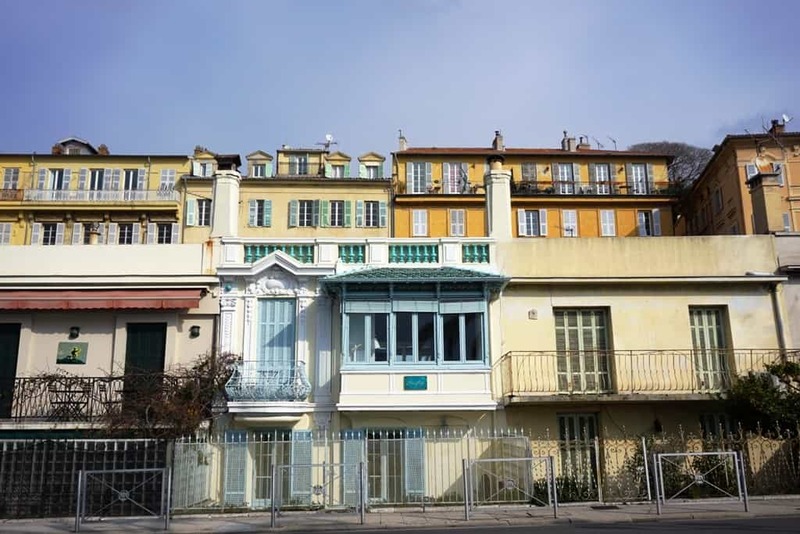 Most of the museums are focused specifically on the art and history from Nice, although both the Marc Chagall museum and Henri Matisse museum highlight the artists’ full careers. There is a Nice museum pass, which allows the holder to visit many of the museums free of charge. Henri Matisse, famed modernist painter and contemporary of Picasso, spent the second half of his life in Cimiez, a suburb of Nice. Known for his cubist and Fauvist style, he is considered one of the founders and influencers of modern art. After deciding in his twenties to become an artist, rather than a lawyer, he went into debt buying art from artists he admired – among these van Gogh, Pissarro, Rodin, and Cezanne. His art style spans decades, from early Impressionist-influenced works to bold, colourful Cubist-style paintings. While compared to Picasso, as both a friend and rival, Matisse preferred to paint from nature while Picasso drew from his imagination. The Musee Matisse is located with Matisse’s own house in Cimiez. It has a varied collection of his works, and is one of the largest complete collections in the world. The first gift came from Matisse himself, in the year before he died. The full collection spans his entire career and highlights his growth as an artist. 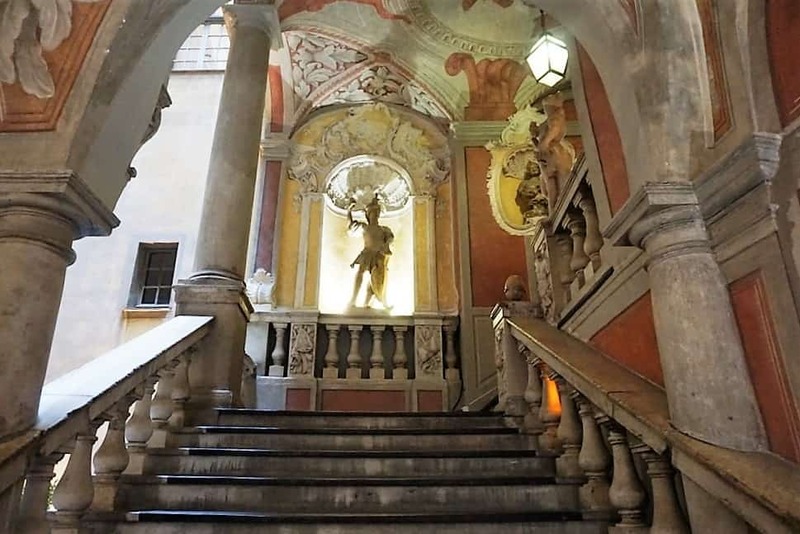 The Lascaris Palais is a 17th century palace in Vieux Nice, or Old Town of Nice, and was owned by the Vintimille-Lascaris family until the early 19th century. In the 1940s, the city bought the palace from its then-owners, and began the process of transforming it into a museum. 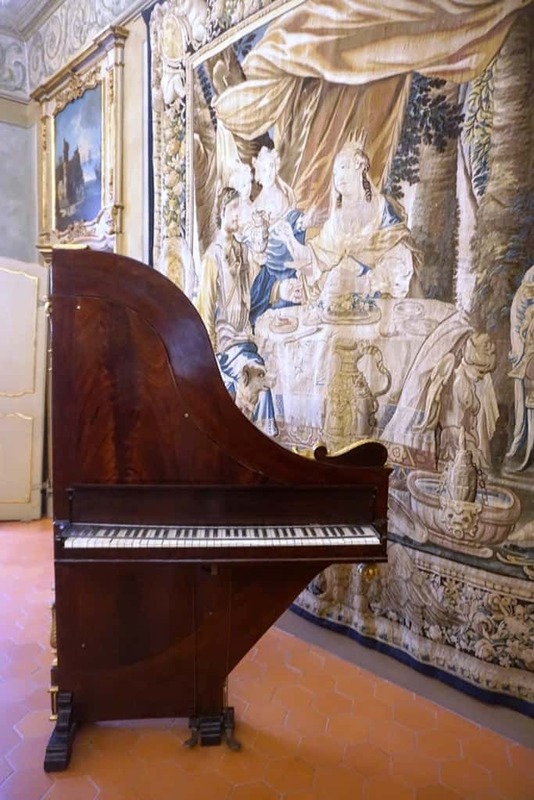 The main exhibition space is home to the permanent collection of musical instruments owned by Antoine Gautier. Gautier was an amateur musician, whose collection ranges from ukuleles to trumpets. He bequeathed it to the museum in 1901, just before he died. 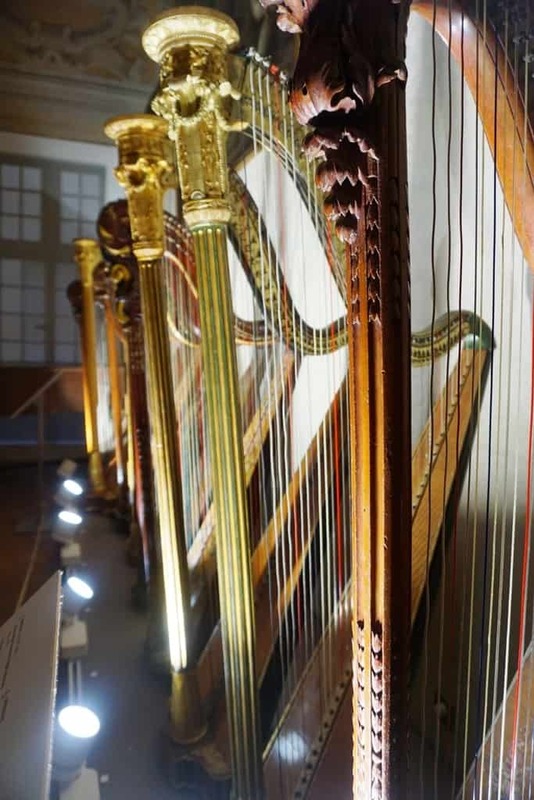 It is considered one of the best antique instrument collections in the world and has been added to and preserved by the museum for over a century. 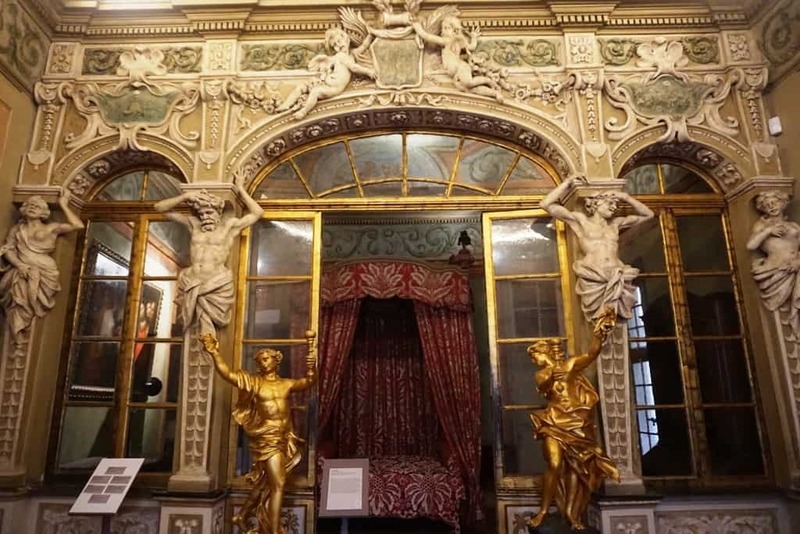 However, the instruments are just one reason visitors enjoy the Palais Lascaris. Built for the wealthiest of families in 17th century Nice, it’s interior is beautifully frescoed, and has unique features like automatic door closers and a medieval era air-conditioning system. This tiny yet eclectic museum is definitely worth a visit. 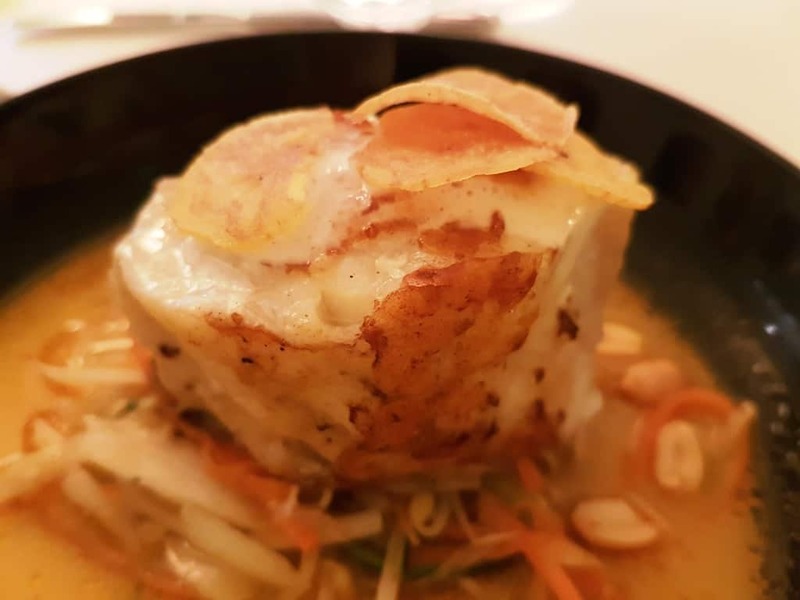 It’s located in an unassuming building in the centre of the old town, a couple of blocks off from Place Massena and the Promenade des Anglais. Charles Negre was a French photographer in the 19th century who is famous for his street scenes of Paris. He was also a pioneering artist using the daguerreotype. The museum does more than highlight his work; it also showcases photography techniques and trends through the last two centuries. As with most Mediterranean cities, Nice has plenty of outdoor space. On a warm winter’s day, there is nothing better than walking along the seaside or visiting gardens. 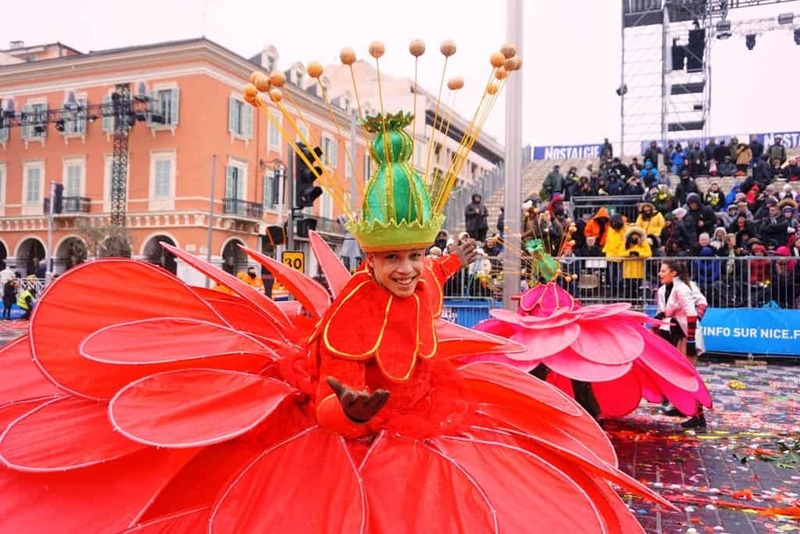 The major Places in Nice are popular gathering spots for locals and also host for the famous Carnaval de Nice. 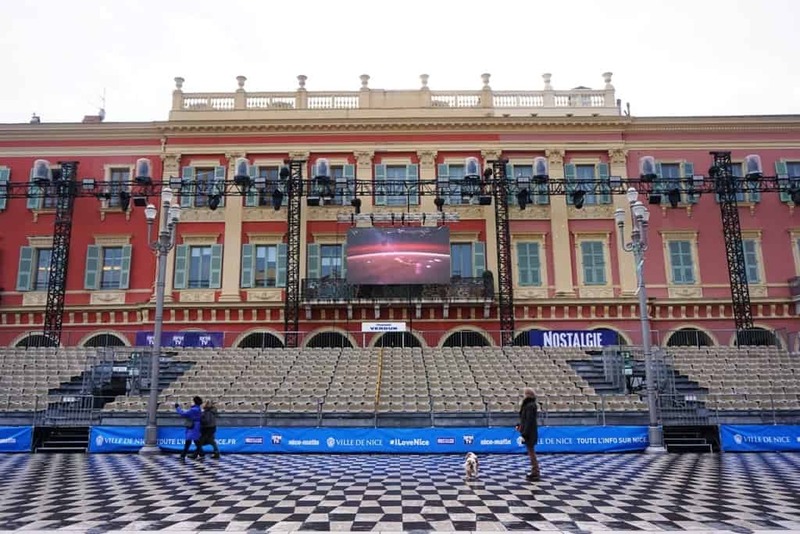 Place Massena is located in the heart of Vieux Nice, less than a five minute walk from both the Promenade des Anglais and the Jardin Albert 1st. It was designed in the 1840s, but until the 1924s was crowded and dense. When the city demolished the casino in the late 1970s, Place Massena became more spacious and inviting. Nice also renovated the city’s tram system, which gave the square back to the pedestrians. There is a gorgeous fountain in the centre of the square depicting various Roman gods. 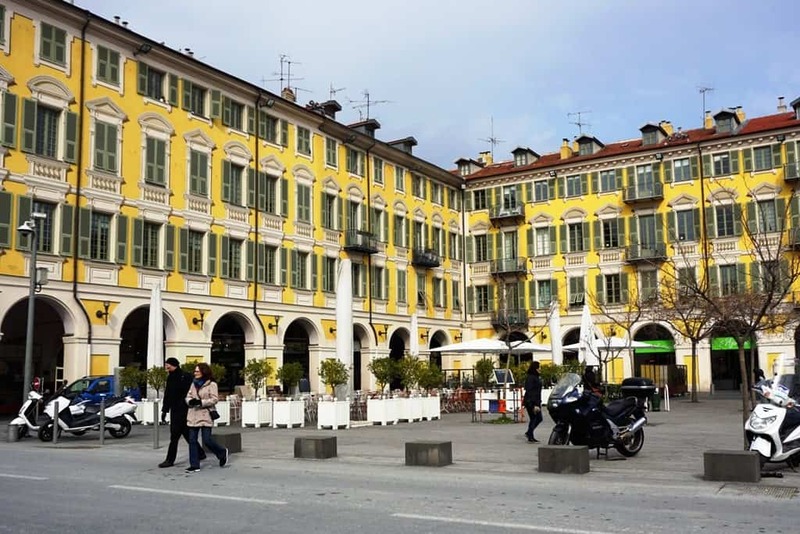 Today, Place Massena is a popular meeting place and is home to a number of cafes and restaurants under the Italian arcades. 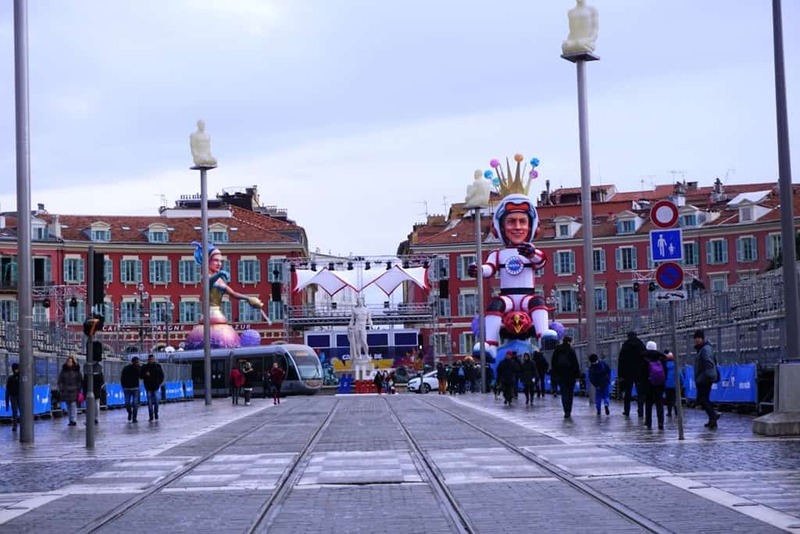 Place Massena is also host to summer concerts, parades, and the famous Carnaval de Nice. 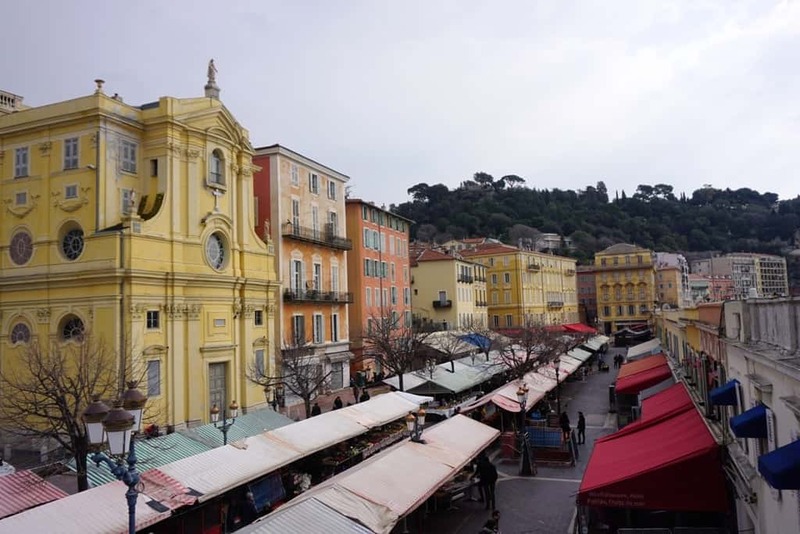 Place Garibaldi is the second most popular square in Nice. 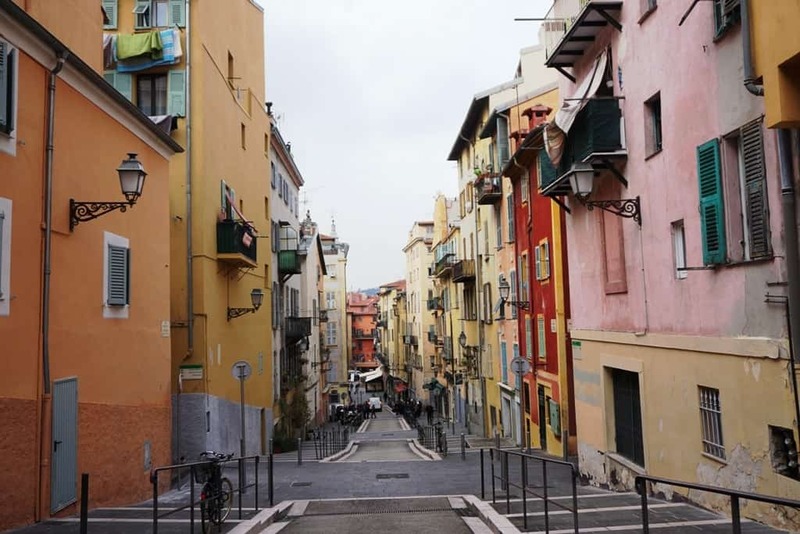 Located at the crossroads between Vieux Nice and the Port of Nice, the square was named for Italian unification hero Giuseppe Garibaldi. It is one of the oldest public squares in the city and is near to many of the museums and attractions of Nice. 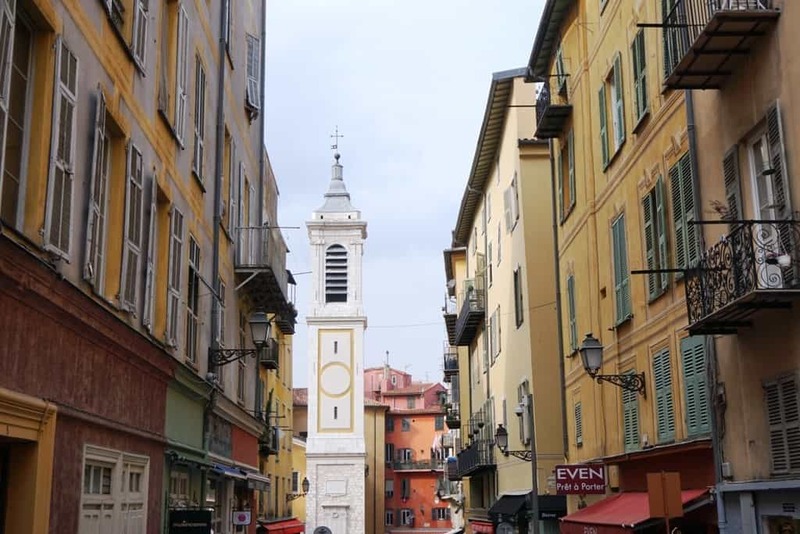 There are nine ornate churches within the square mile of Vieux Nice, all with their own history. 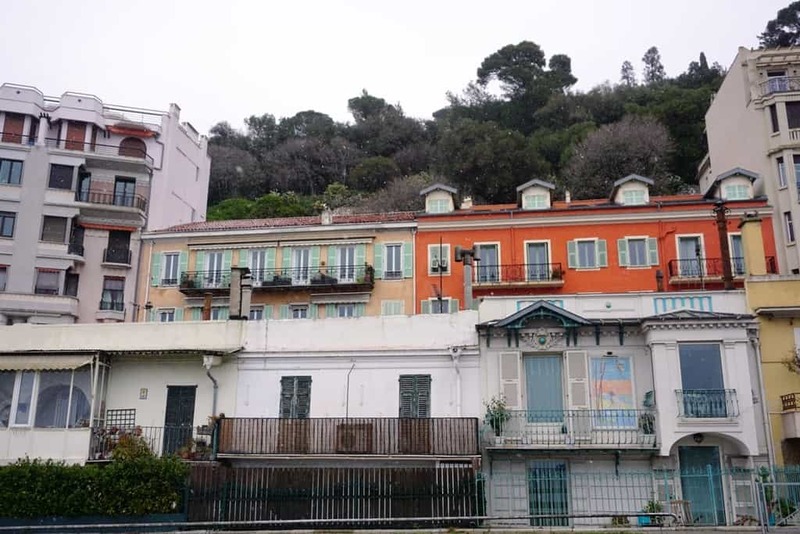 Here are just a few you may see while exploring Nice. 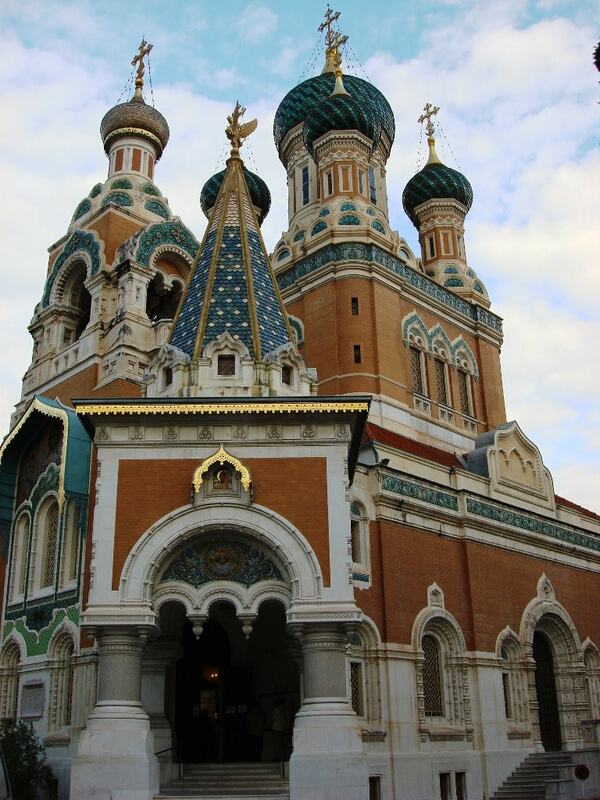 The Saint Nicholas Russian Orthodox Church is a bold coloured, turreted church in Nice. 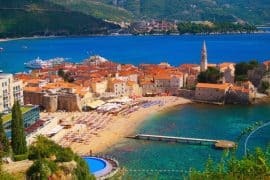 It was funded by Tsar Nicholas II, following an era in which Russian nobility came to France seeking quiet seaside escapes and a pleasant climate. The land the church sits on is considered property of the Russian Federation, so by setting foot inside the church you are technically in Russia! 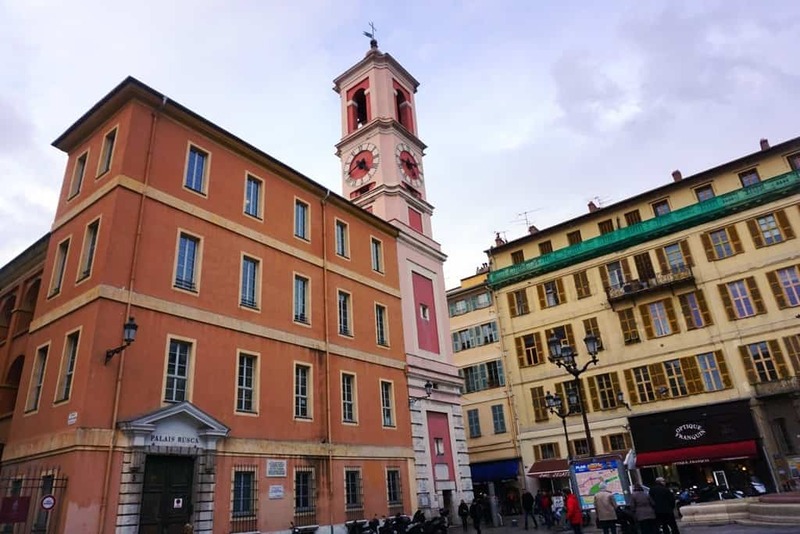 The Church of Saint Jacques le Majeur of Nice, also known as the Church of the Gesù or Église de Gesù (French), is a 17th century Baroque-style church in the centre of the city. The church was commissioned by the Jesuits of Nice, who were gifted a large sum of money by a wealthy Roman patron. 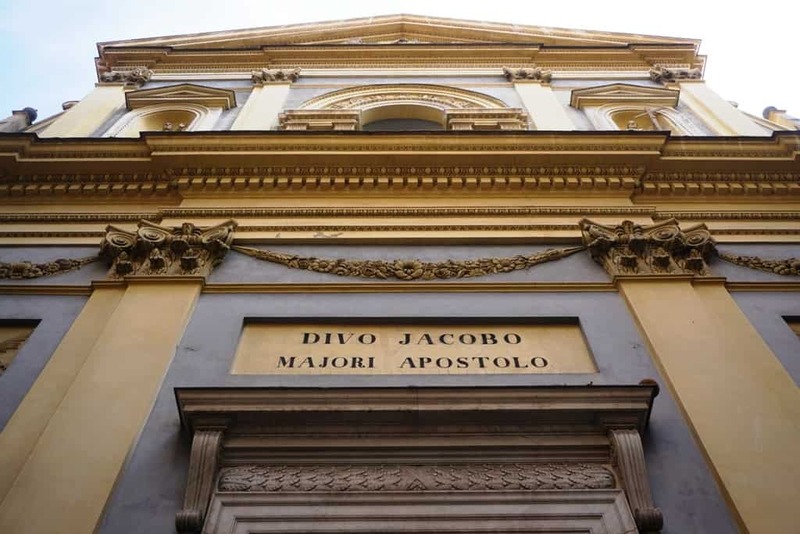 They established a commune and created a school in the early 1600s; the Jesuits laid the cornerstone of the church in 1642 and the small cathedral was completed in 1650. 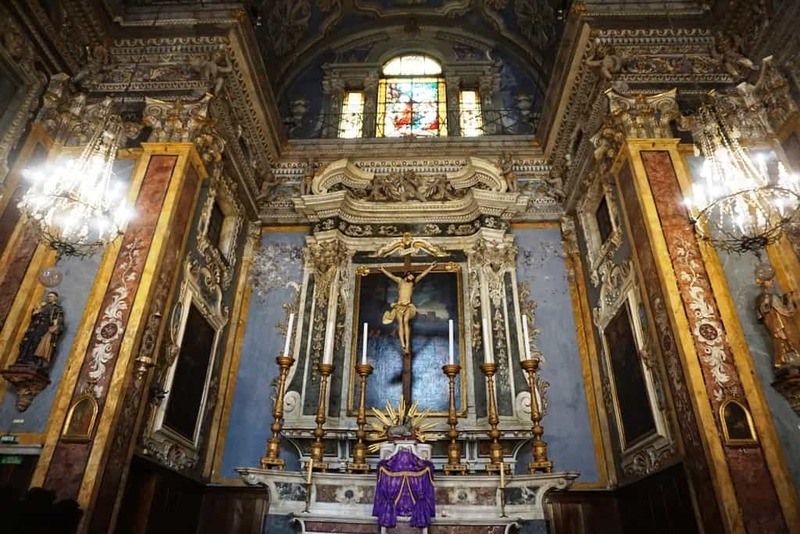 When Pope Clement XIV expelled the Jesuits from Nice in the late 1700s, the church became a royal possession, and finally a Roman Catholic parish. It is open until midnight every night, if you’re the type of person who enjoys a quiet, unassuming place to reflect. Cathédrale Sainte-Réparate is the official cathedral of Nice; it is located in the heart of the old city between Palais Lascaris and Opera de Nice. The Baroque-style cathedral was built in 1650 but not completed until 1699, while the small campanile is decidedly 18th century. Further additions continued until nearly 1950. Cathédrale Sainte-Réparate is situated on the footprint of a much older cathedral, St. Mary of the Castle, which was built in the 11th century. By the end of the 11th century, the relics of Sainte Réparate had been brought to Nice and were entombed in a small chapel at the base of the old cathedral. The Baroque interior contains ten chapels, three organs, and a small atlar in which the remains of Ste. Réparate lie. 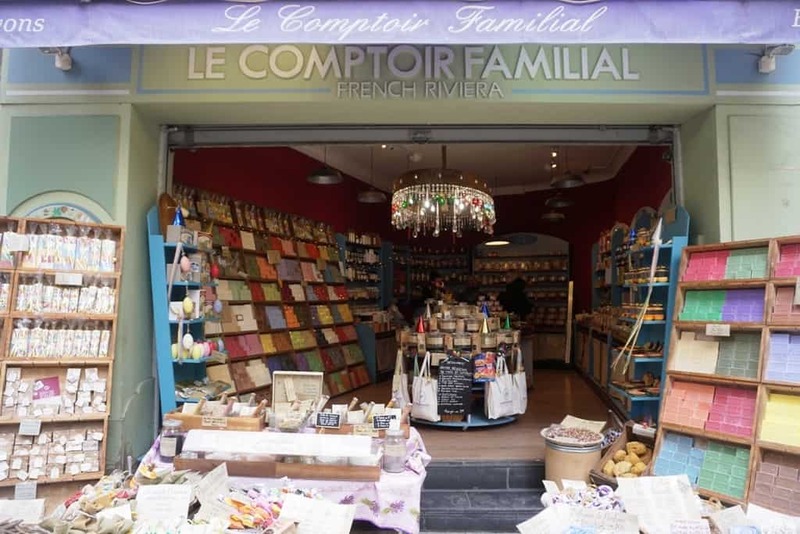 Like any other Mediterranean city, Nice is awash with markets and local vendors selling their produce, homemade cheeses, soaps, or honey and jam. 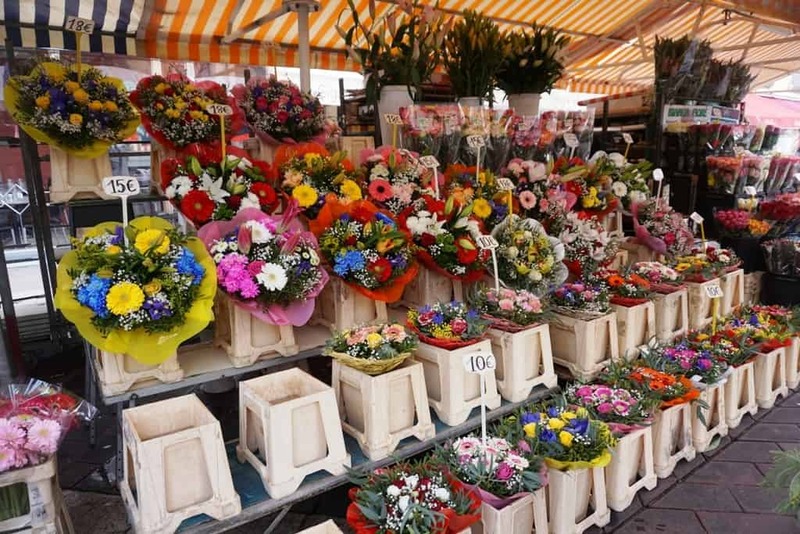 Cours Saleya is Nice’s famous flower market, but it does have more than just flowers. 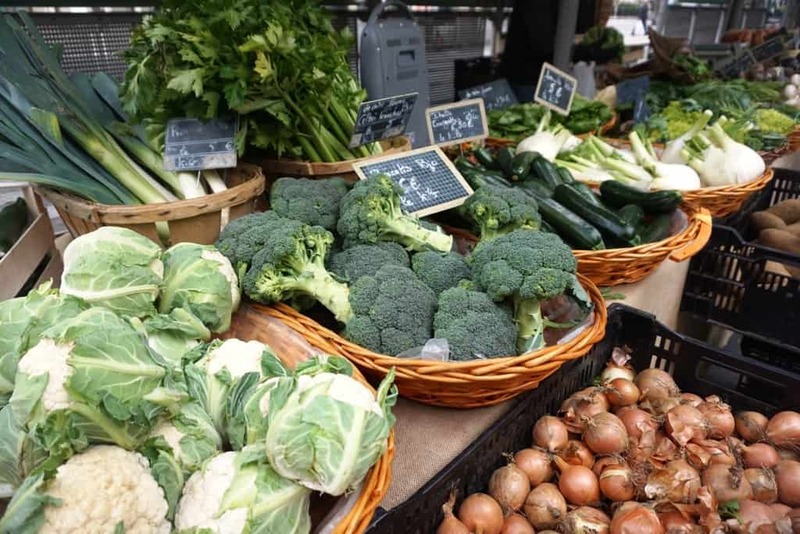 There are stalls selling vegetables, spices, fruits, and more. It’s truly a paradise to wander! Cours Saleya is located at the entrance to the Old Town, just behind the Les Ponchettes galleries and the Promenade des Anglais. It’s brightly coloured striped awnings are noticeable from a distance, as are the crowds of people who come here. The food stalls are only open until 1pm, while the flower stalls stay open throughout the day. 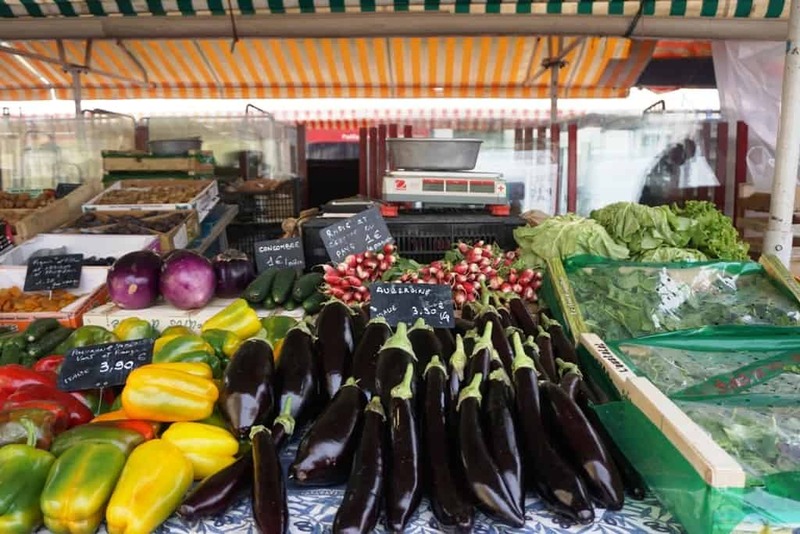 The market is open Tuesday to Saturday, although on Mondays it transforms into an antiques market selling all sorts of interesting things. 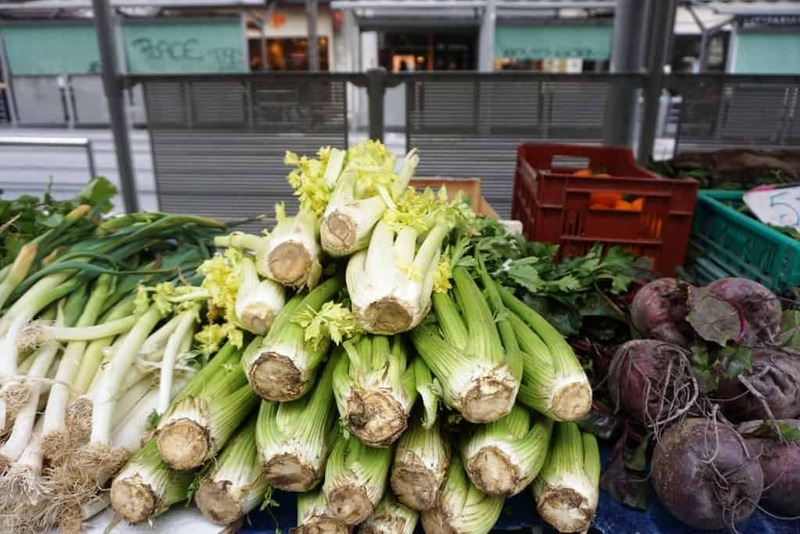 The Liberation Market is located at Place du General de Gaulle, near the Town Hall and the Gare Sud train station. 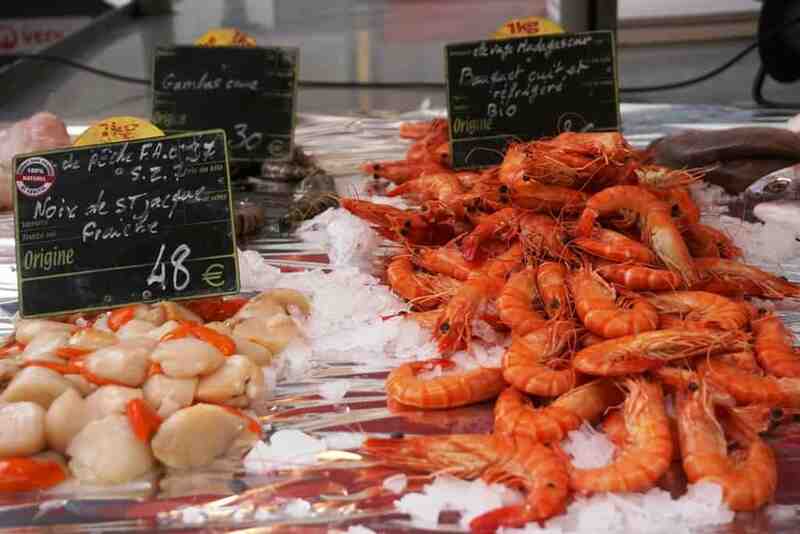 While it does have vegetable and fruit stalls, its much more well known for its fish market. 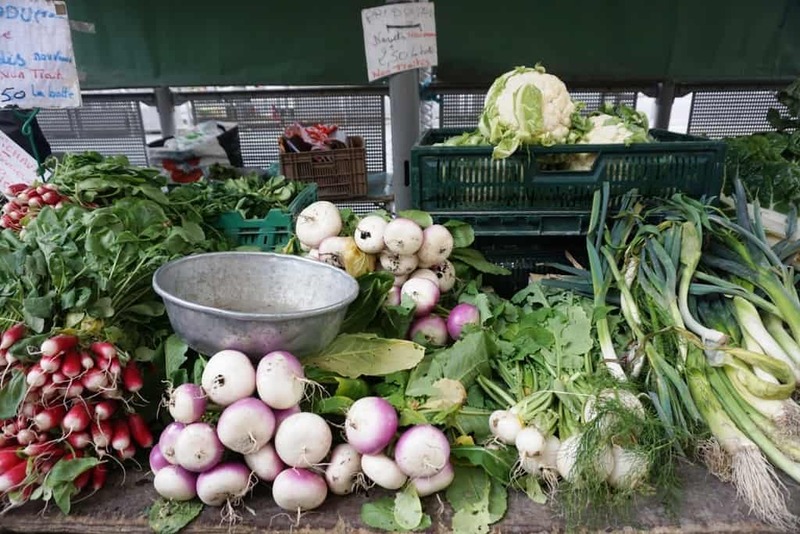 On top of that, the Marche de la Liberation is a more authentic local experience and a little less expensive than Cours Saleya. 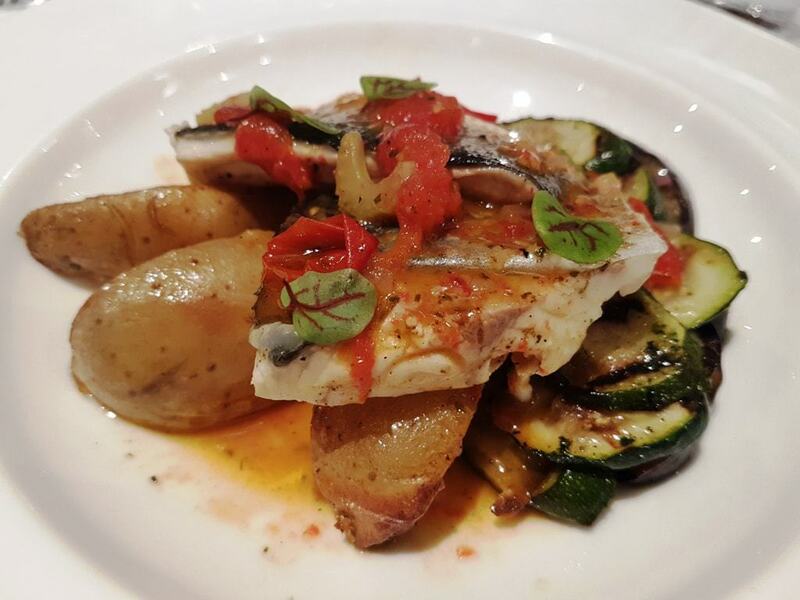 Niçoise cuisine is quite literally one of a kind. 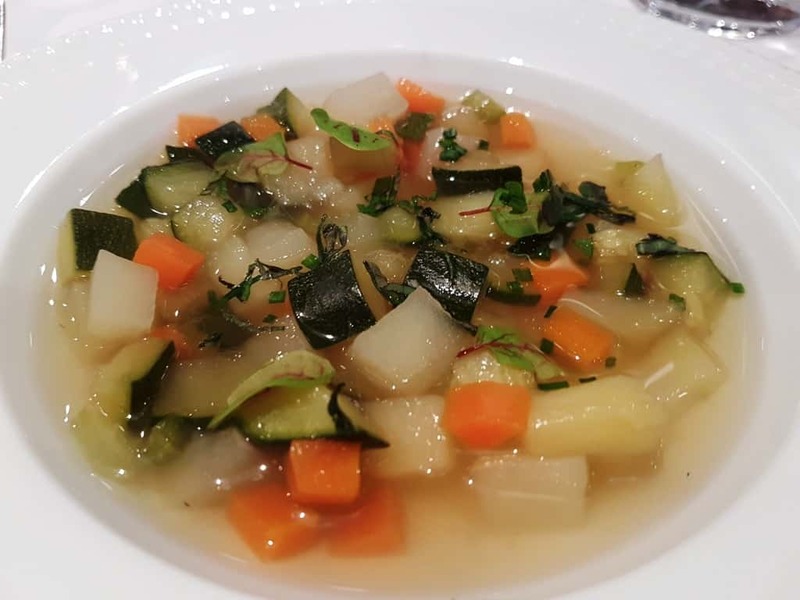 The Nissards are very proud of their cuisine, so much so that they have created a certification program entitled Cuisine Nissarde. 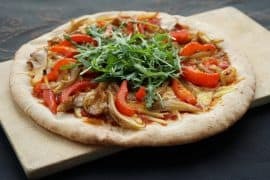 This program is awarded to those who work to preserve the Nissard way of cooking, with local ingredients and traditional recipes. 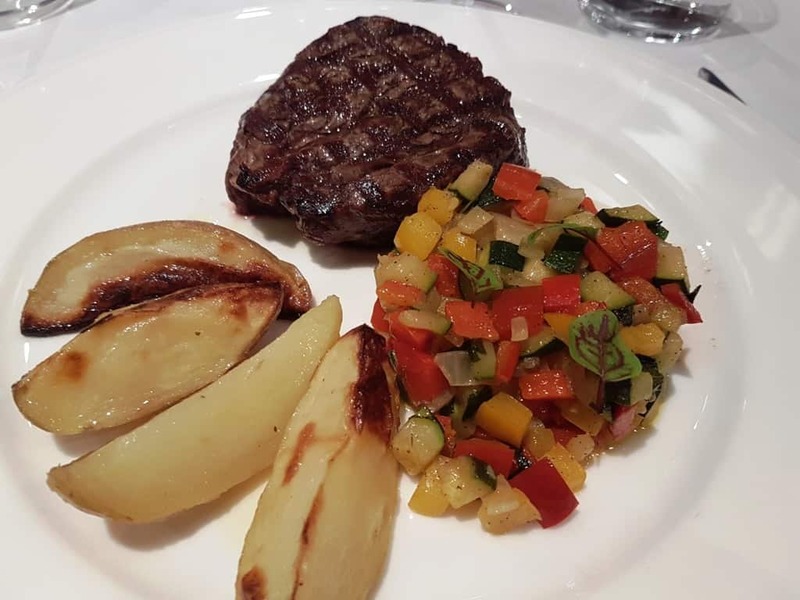 Restaurants qualify if they serve authentic Nicoise food like fruit confit, Pissaladière, or Salad Niçoise. 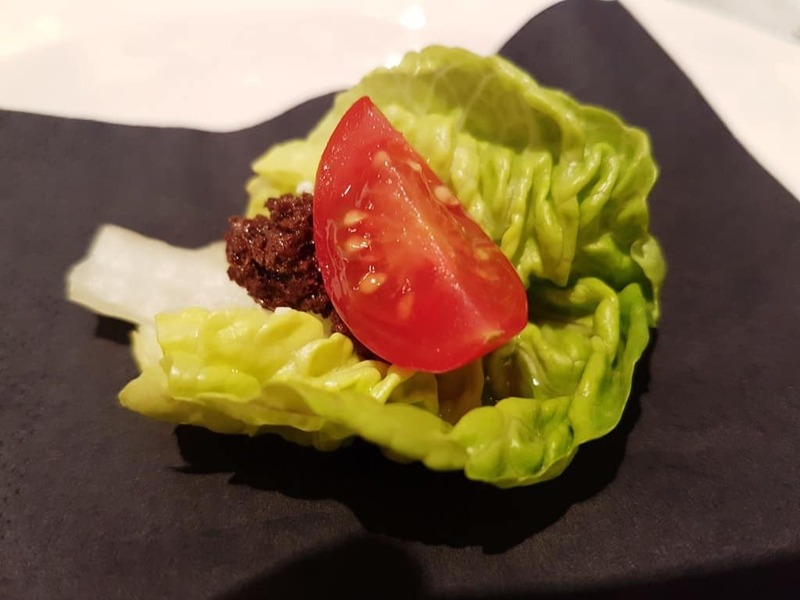 There are, as of 2018, just over 20 restaurants with this distinguished label. Socca: A kind of pancake or crepe made from chickpeas. 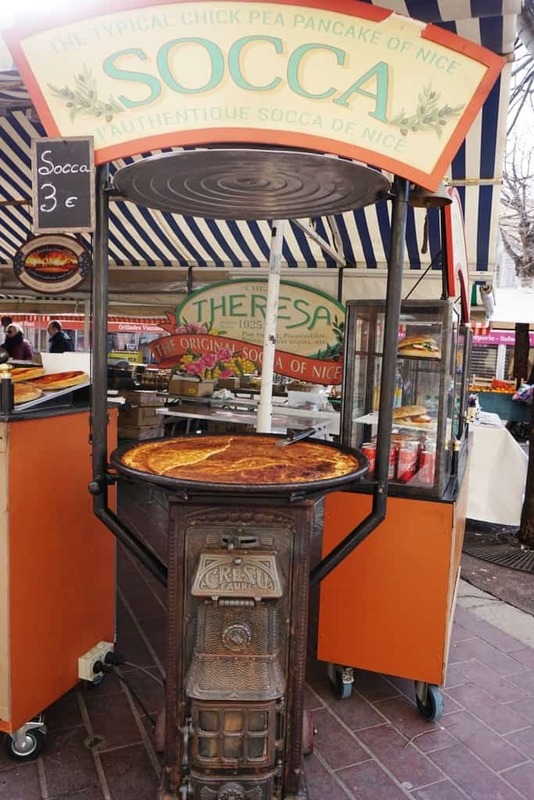 You can try socca in many places around town and the Cours Saleya market. 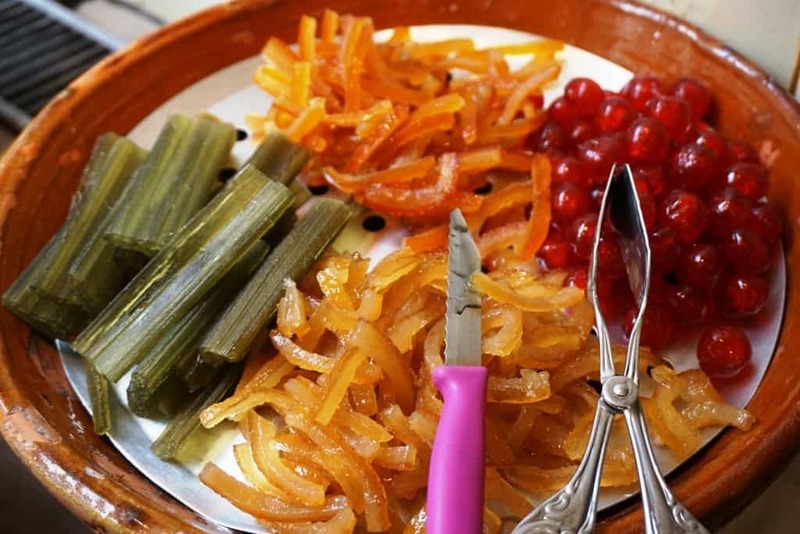 Maison Auer: Nice is famous for the candied fruits. 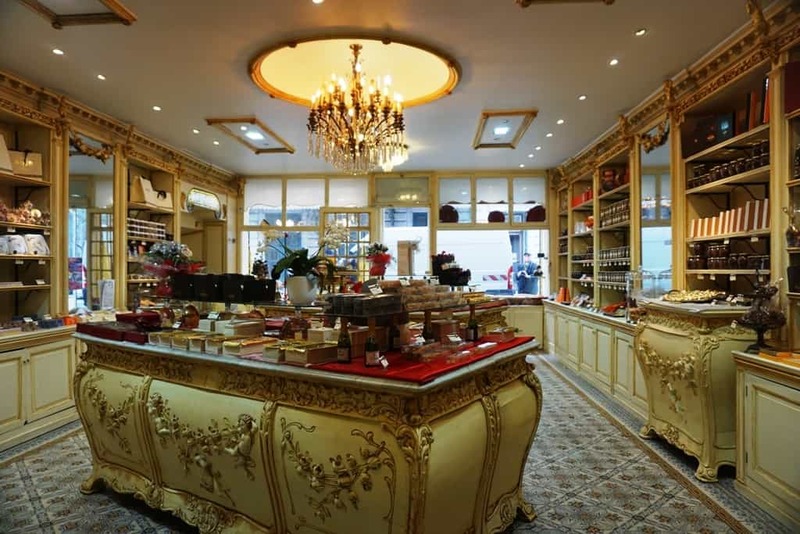 The best place to buy them is the Maison Auer, a beautiful pastry shop that operates since 1820. 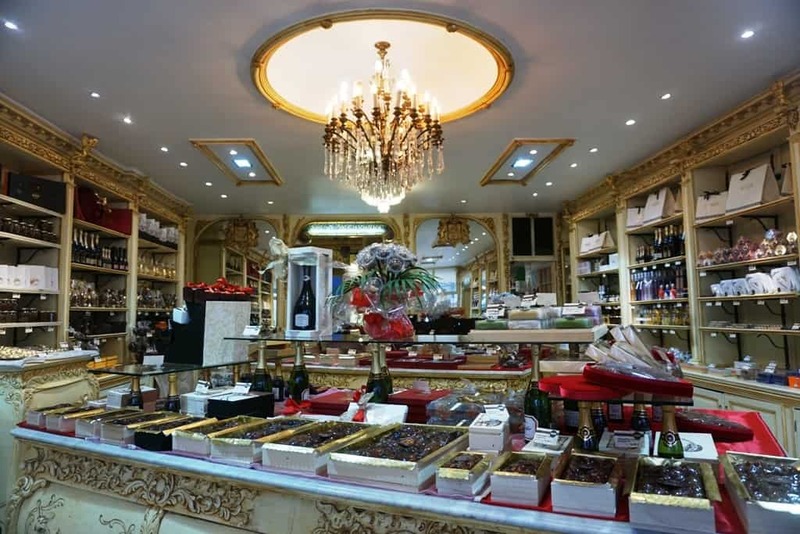 Apart from the candied fruits you can buy chocolates and glazed chestnuts. 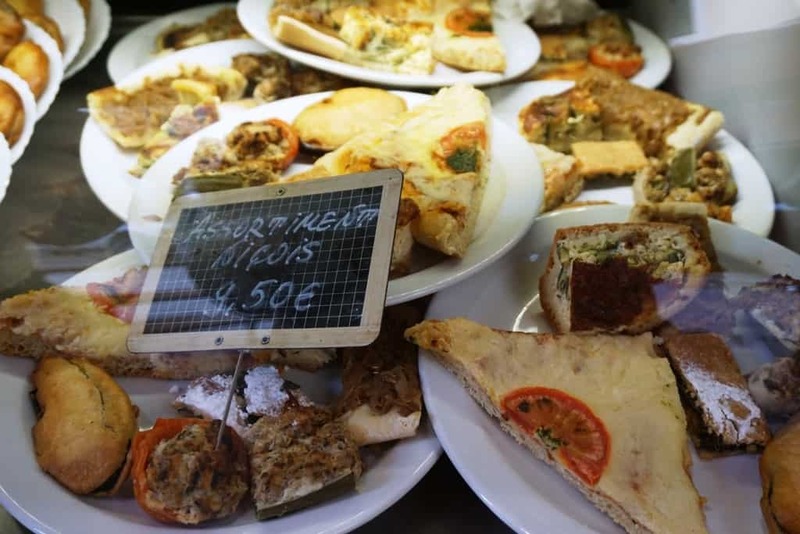 Street Food: There are many shops around Nice that sell the local delicasies on a plate which you can take and eat on the beach or in a park. Pic Nics are very popular in Nice among tourists and locals. 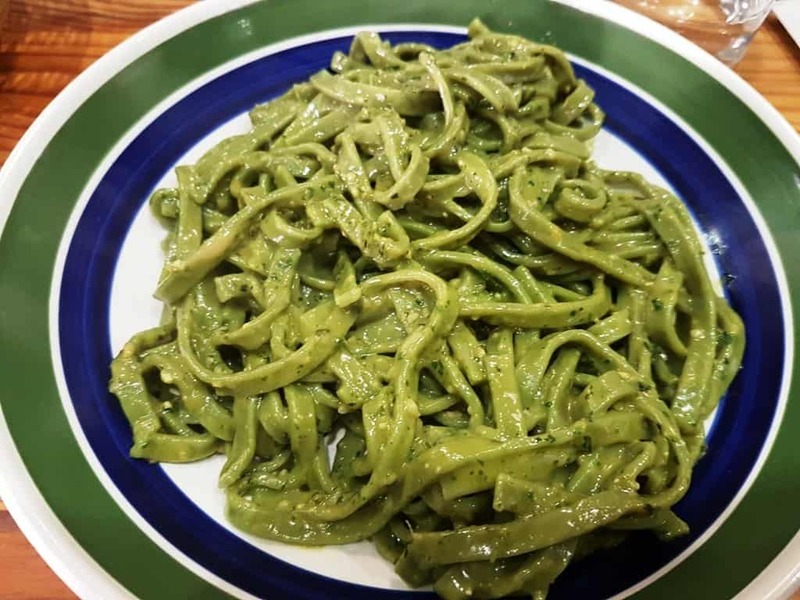 What a better way to enjoy the local cuisine than learning to cook it yourself. Rosa Jackson organizes cooking classes and street food tours. 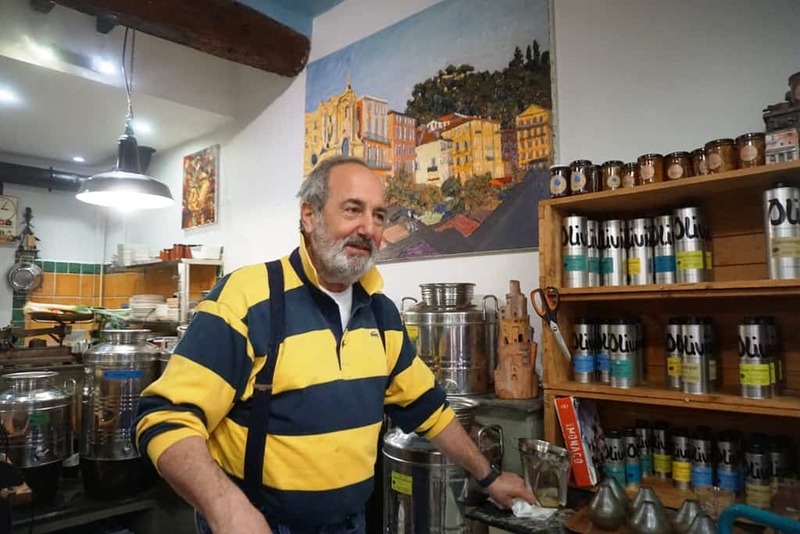 L’ Oliviera is located in the Old Town and specializes in olive oil from small producers around France. 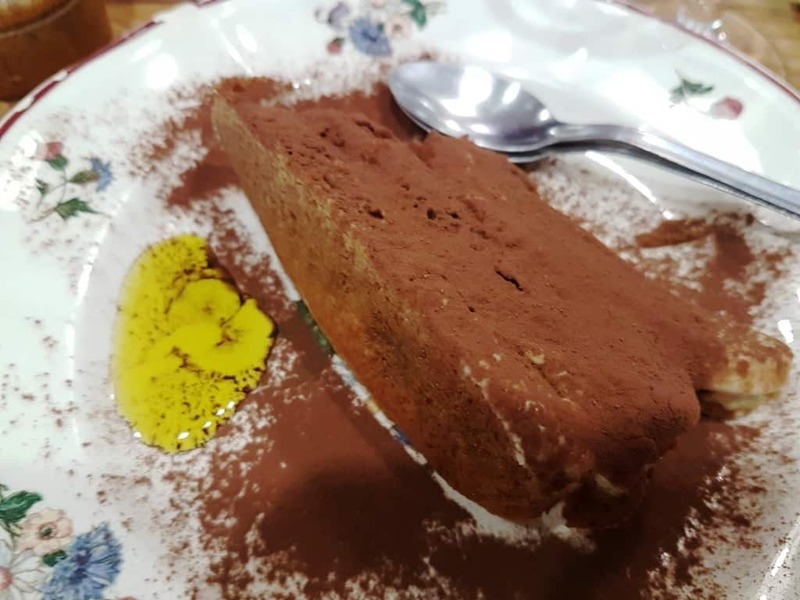 All the dishes are home made and are paired with olive oil. 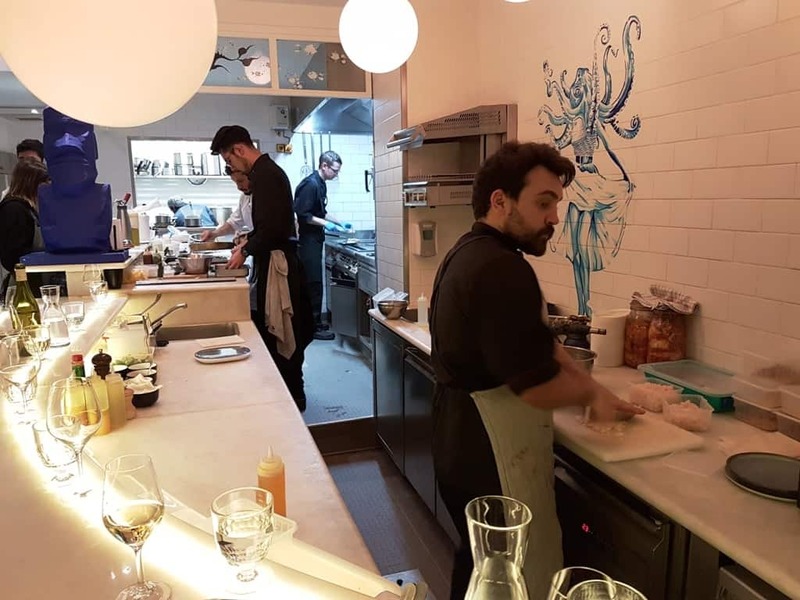 The owner Nadim, is very passionate and attentive. The food is delicious and the ambience is great. 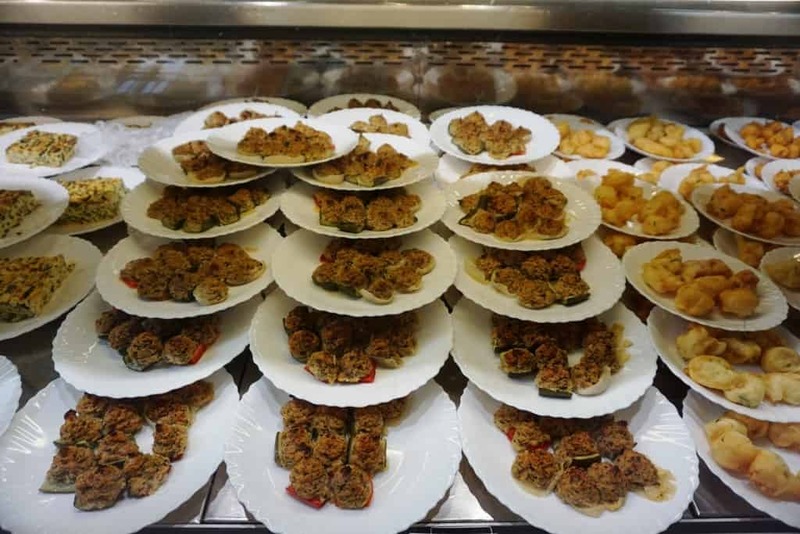 Located near Place Massena, this small restaurant with the Mediterranean feel specializes in fish and seafood. There are a few tables but there are also seats on the bar from where you can watch the chefs prepare the dishes. 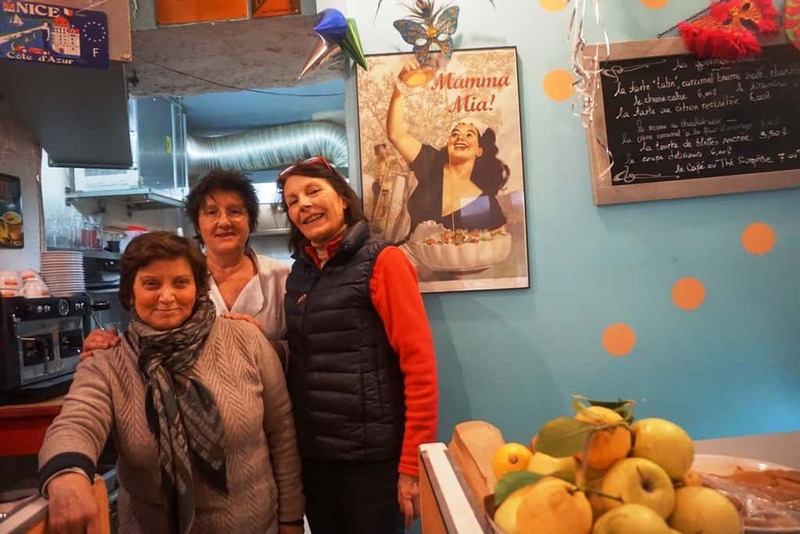 Situated in Nice Old Town, it is a Cuisine Nissarde certified restaurant run by 3 lovely ladies who cook traditional regional dishes using local ingredients. 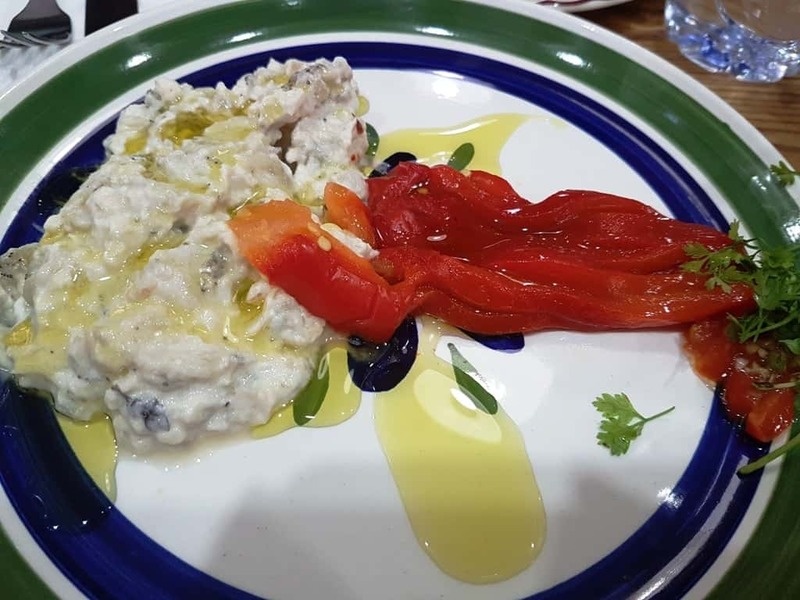 Dishes include Pissaladiére which is made with bread dough and is topped with caramelized onions, olives and anchovies and many more local delicacies. 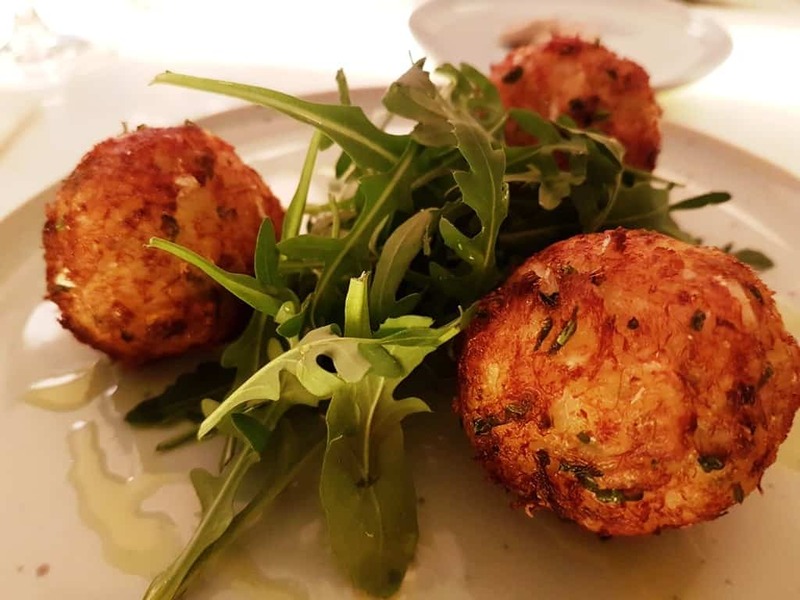 This chic restaurant serves Italian cuisine using fresh products from the sea. 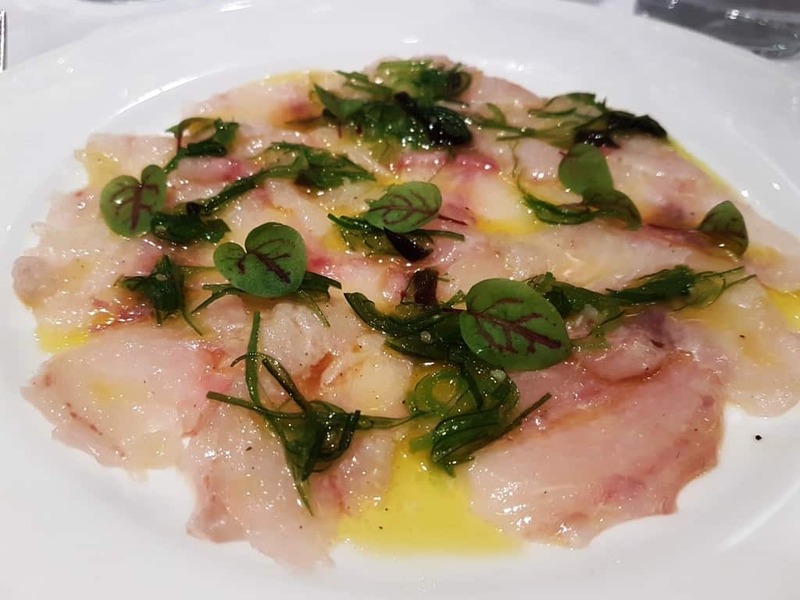 The chef Christian Perria who specialises in raw fish, is also a World Champion in seafood preparation. 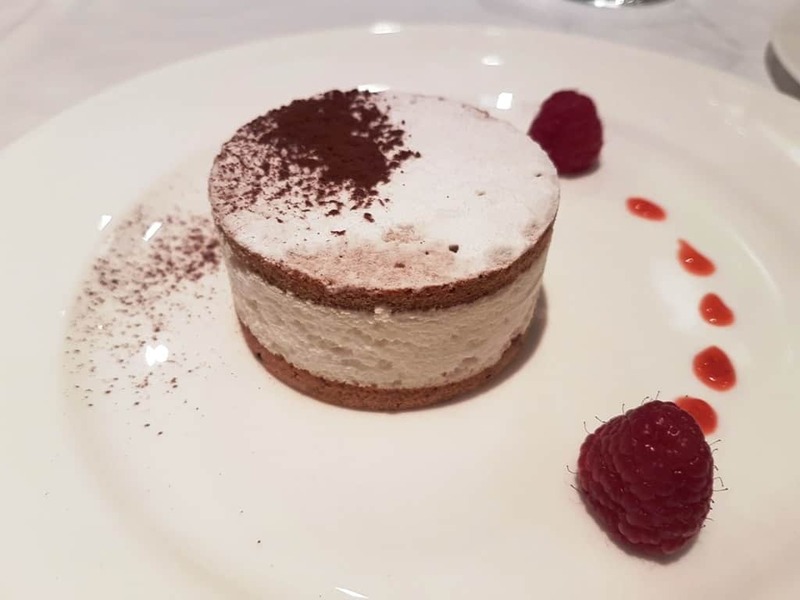 The food is exceptional and the service very attentive. 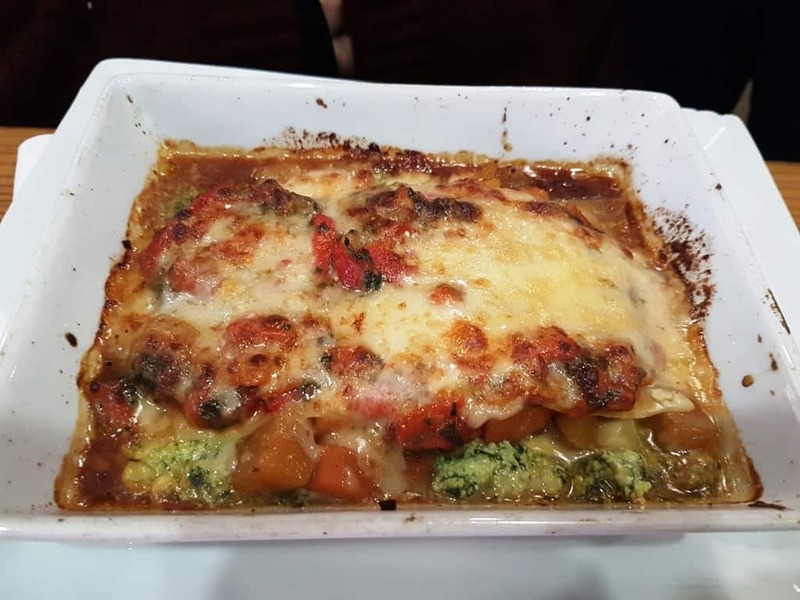 Located in Garibaldi square this beautiful restaurant serves authentic Italian cuisine. 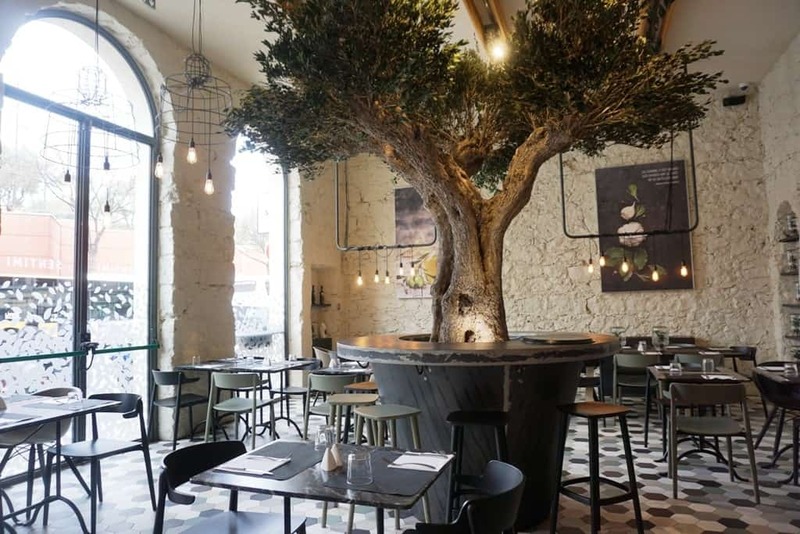 A great champane and wine bar located near the Liberation Market. 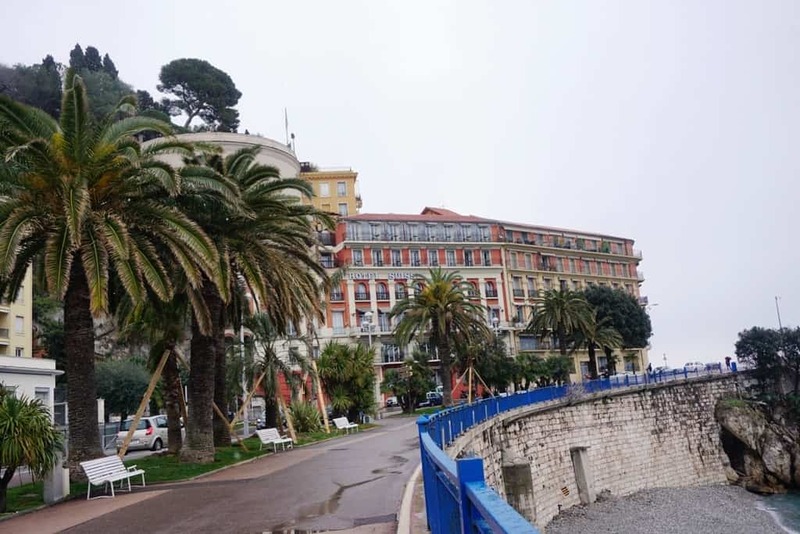 Nice has plenty of beautiful hotels within its Old Town. Here are just two that I recommend. 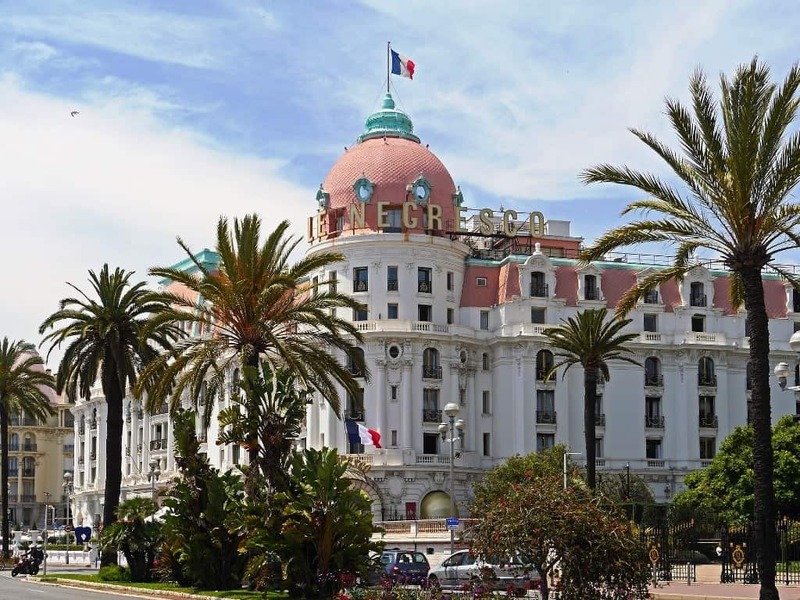 With its iconic pink dome and fabulous 16,309 crystal chandelier, the Hotel Negresco stands proudly as the Grande Dame of the Cote d’Azur. 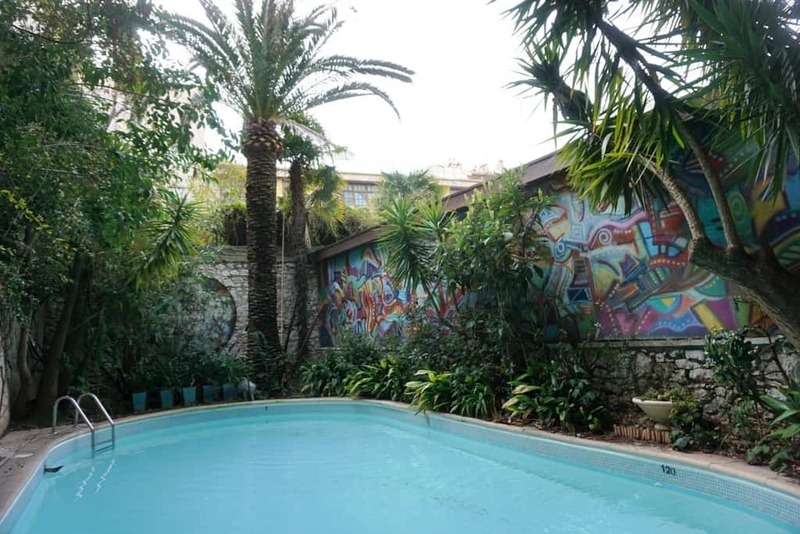 Its location on the Promenade des Anglais is exceptional and in the heart of everything. 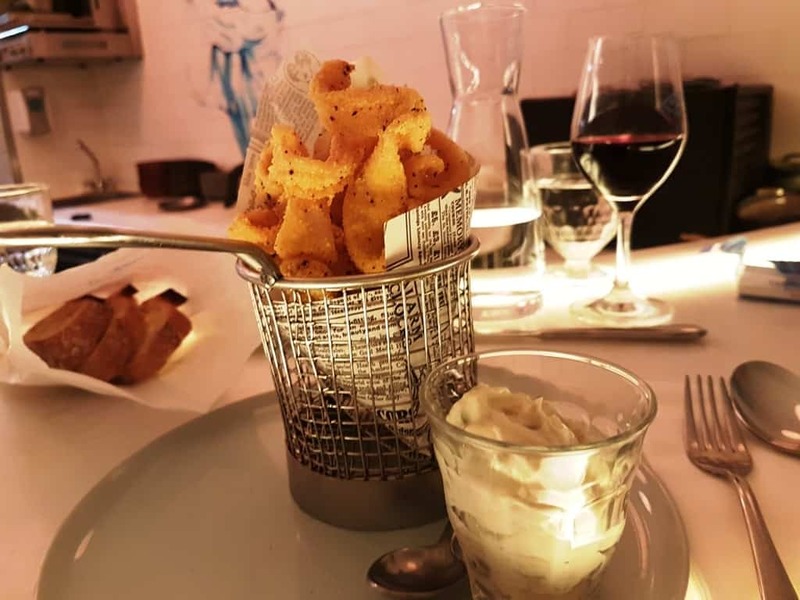 It has a two-Michelin star restaurant, a cosy bar, and a brasserie that evokes a merry-go-round. Read about my stay here. 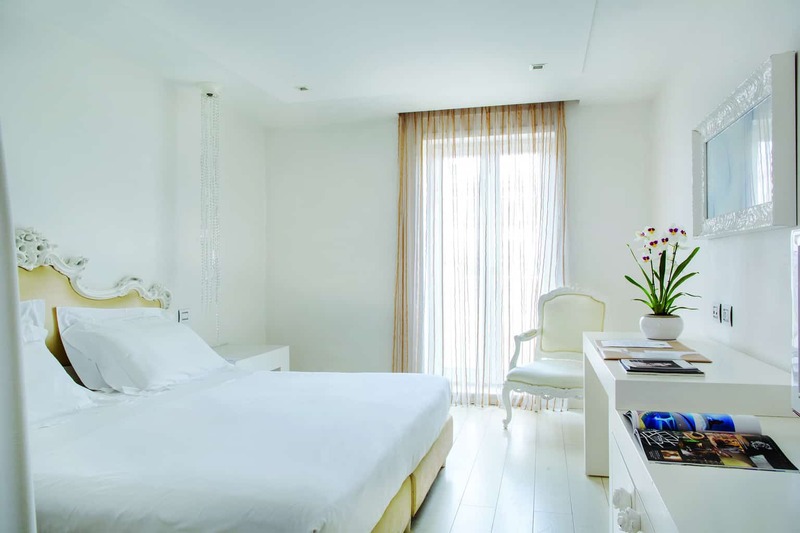 The Hotel Windsor is a family-run contemporary art hotel in the heart of the city. Its boutique-style atmosphere and 19th century facade bely the incredibly unique interiors, which range from whimsical to fantastical and beyond. Rooms are designed or inspired by artists, and a new one is created every year. Tucked away in the courtyard, the gardens and pool offer a respite from the bustling streets. 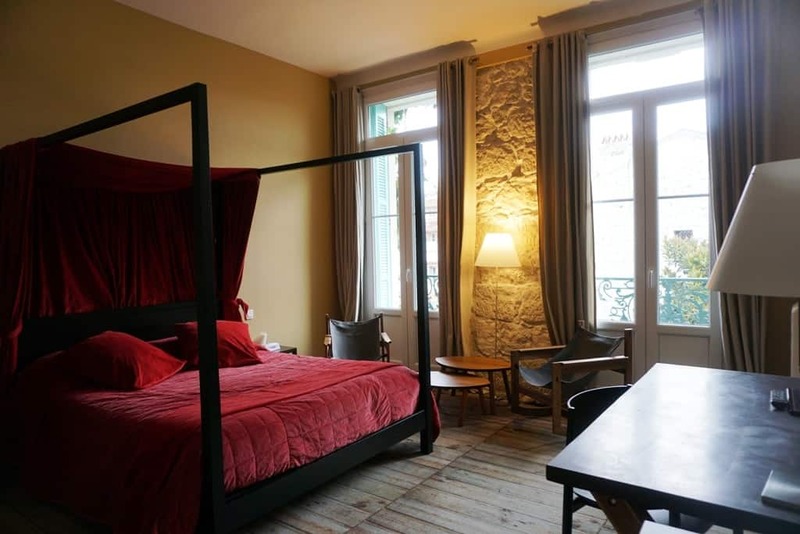 Housed in a historic building in the beautiful Boulevard Victor Hugo in central Nice, this five star hotel offers spacious rooms with elegant furnishing. Other hotel amenities include a bar, Le Pesceria restaurant and a fitness and spa area complete with a swimming pool and a Hammam. 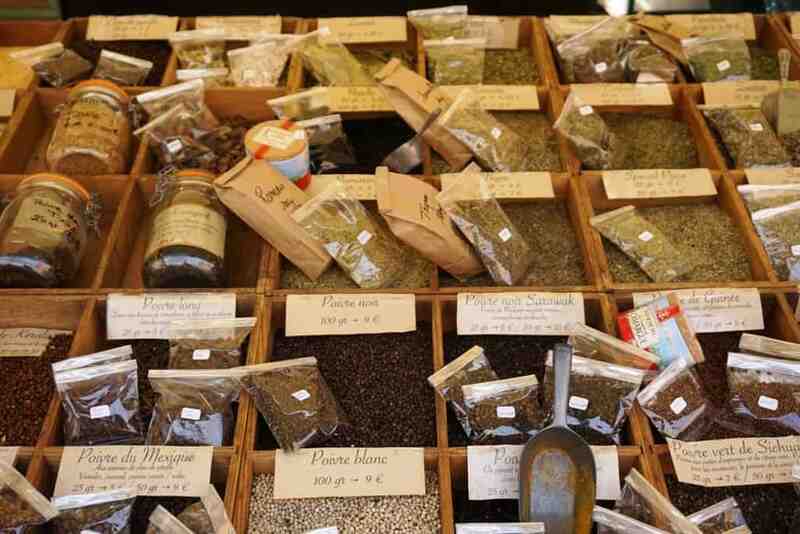 From its historical spots to the outdoor markets and sandy beaches, Nice is a unique place to visit all year round. 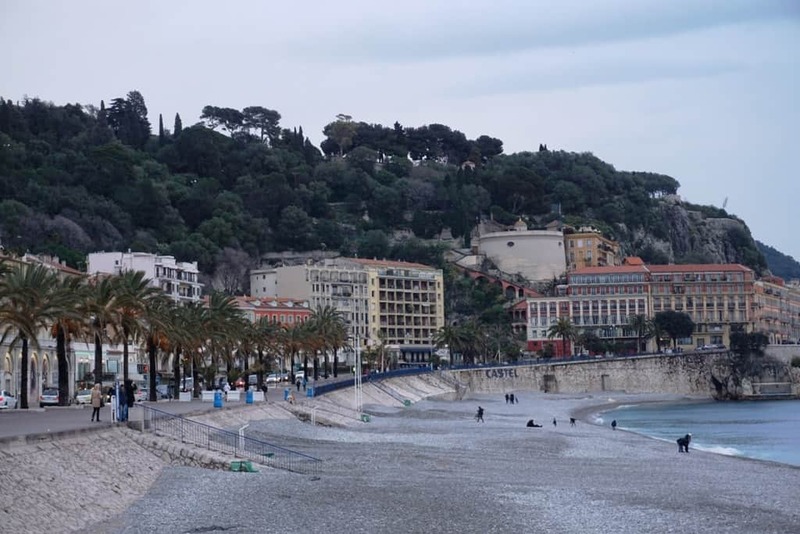 Have you been to Nice in winter?